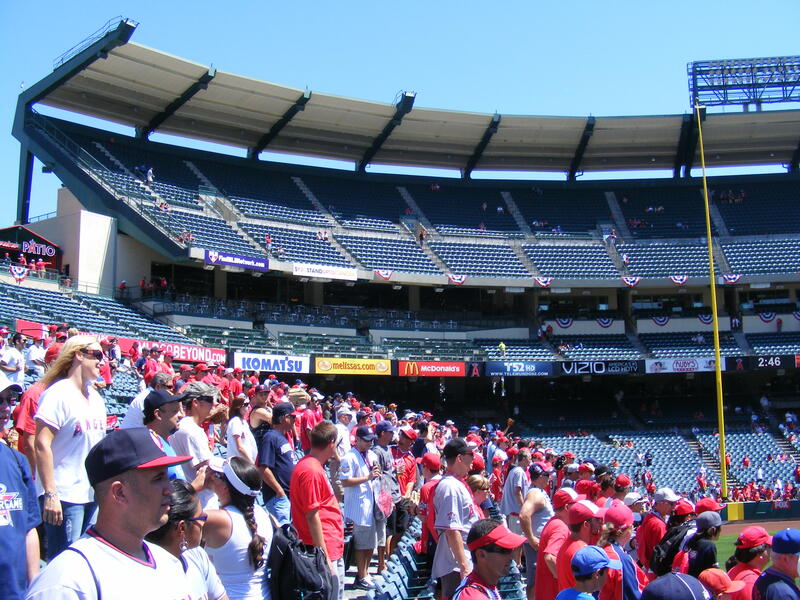 I’d barely had time to rest since the All-Star Game and I was back, driving along the 55 to the 5 to the 57… and I arrived plenty early for the AL West showdown between the Angels and the Mariners. I was pretty pleased to see such a light crowd at the gates. 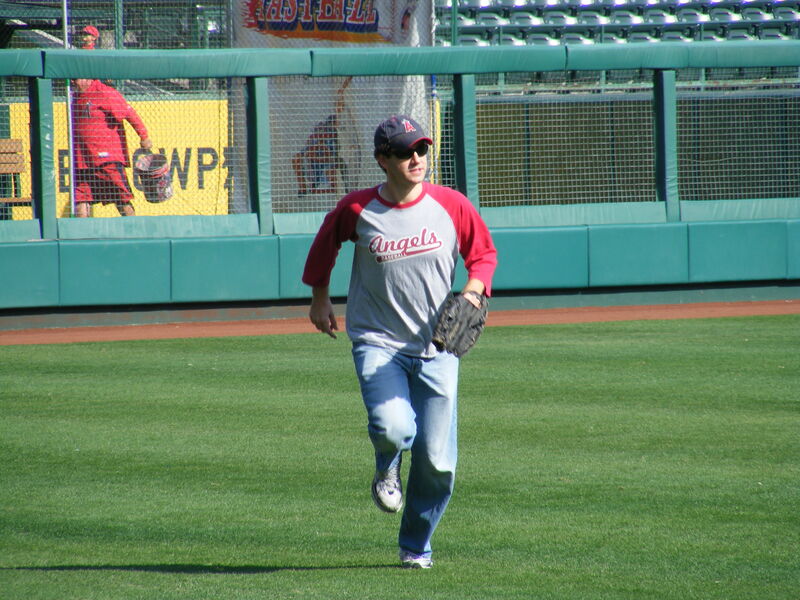 I ran in and started searching the right field seats for Easter eggs. No luck. spotted Ball #1 in one of the last rows of the pavilion. The gates had been open for more than ten minutes and I couldn’t believe it. 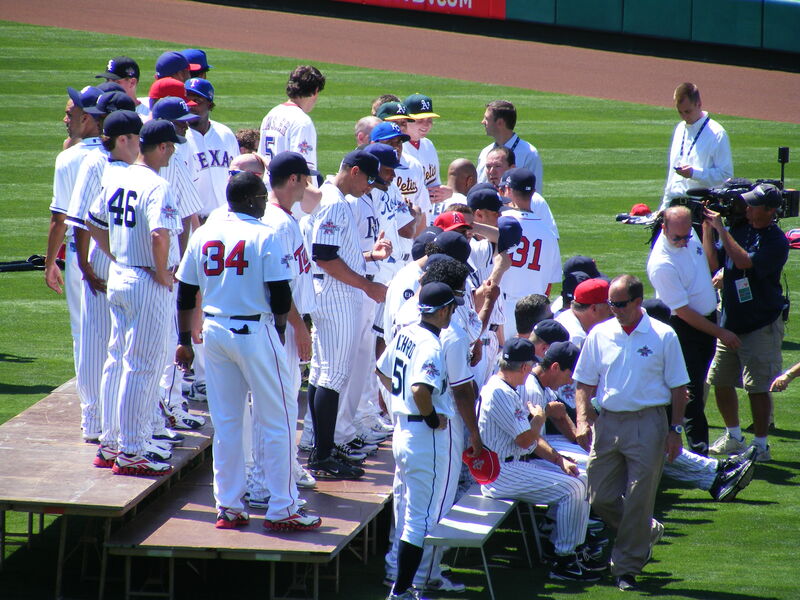 There were, at that point, at least twenty people in the seats… I looked at the guy next to me. “Did you drop this?” He said he didn’t. So, I picked it up. 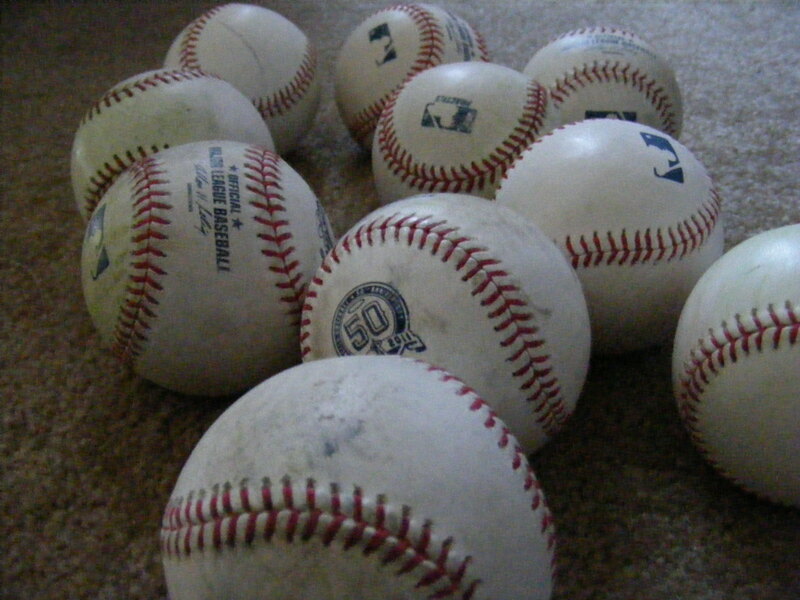 Wow–crazy… the only other time I had found a ball after the first minute or so of the stadium being open was earlier in the season at PETCO Park. player on a bounce, just beating out a couple of other guys for it. I think it was Torii Hunter that hit it but it could have easily been Mike Napoli or Juan Rivera… I never got a good look at the batter. 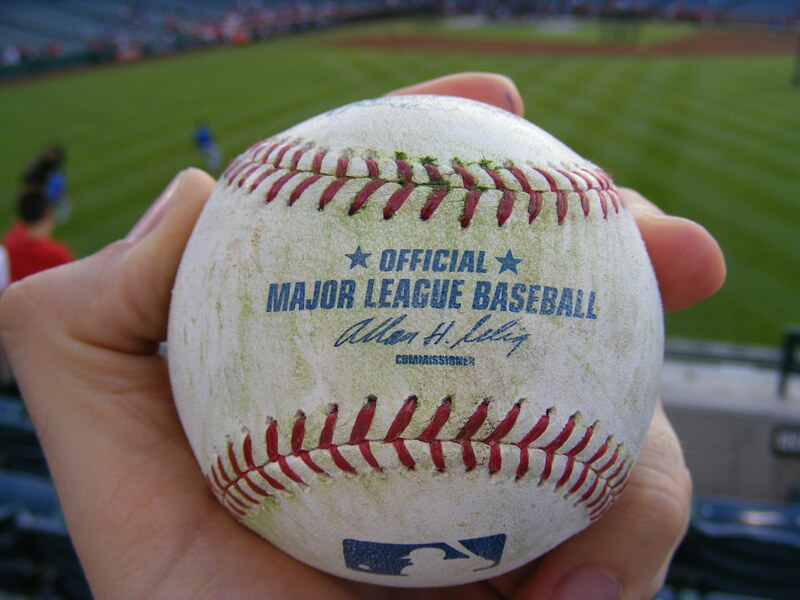 I gave that ball away to my favorite usher. She usually finds a young kid to give the balls away to but I always tell her she’s welcome to keep ’em for herself if she wants. closer David Aardsma to toss me Ball #3 after he finished playing catch. Then he underhanded Ball #4 to me. So, it counts as a thrown ball and not a hit ball. I was glad to get the snag but bummed that I’d made such a poor play on it. 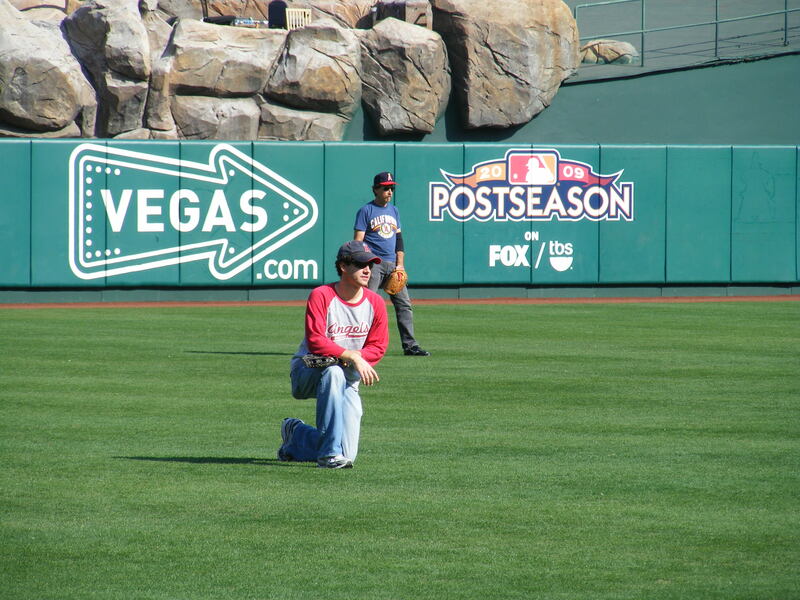 I gave that ball away to a nearby kid and ran back up to the pavilion but I didn’t snag any other baseballs during BP. 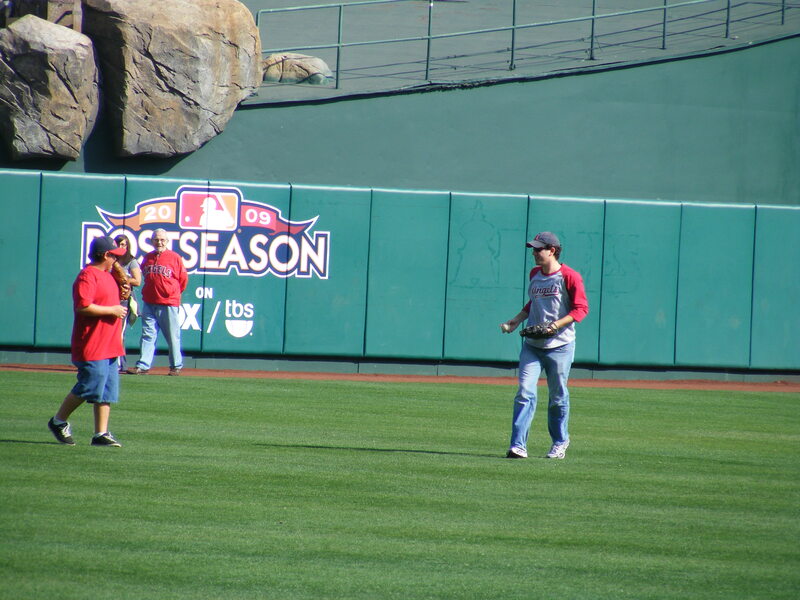 I ran to the dugout as the Mariners headed in but didn’t get anything there… I did see Mike Sweeney playing catch with a kid that, I assume, was his son. Sweeney’s from the area and always has family and friends around when the Mariners play the Angels. I’ve talked to him a couple of times. 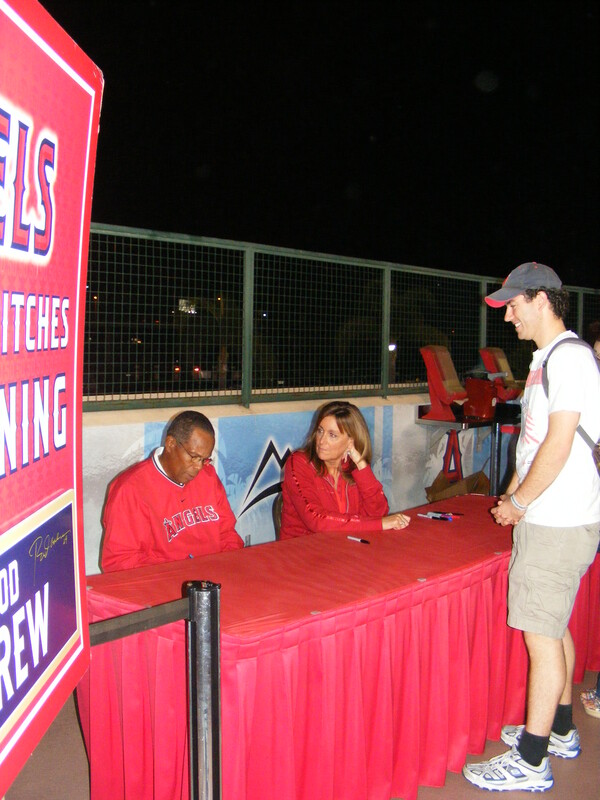 He’s super nice and always signs autographs if fans are polite about it. He’s a real cool guy in my opinion. how small the crowd seemed after the ASG events we’d seen. 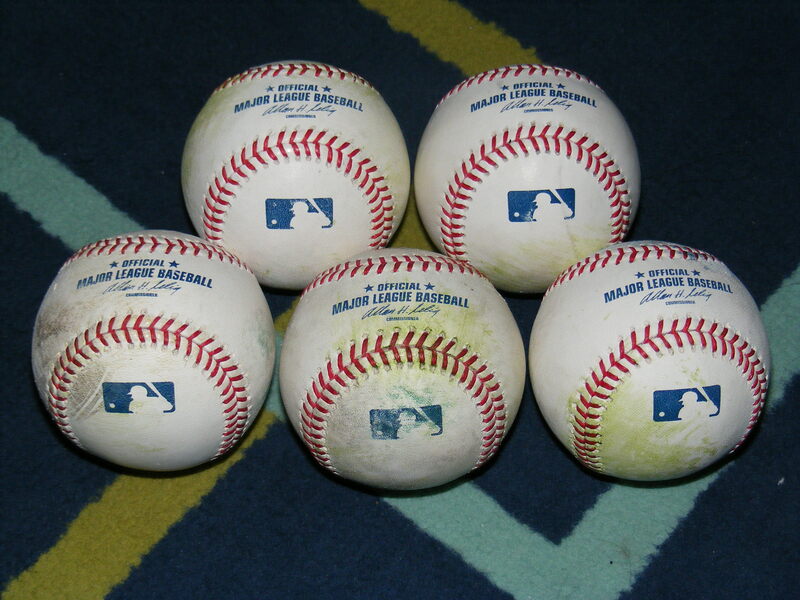 And I, of course, planned to try for a third out ball each time the M’s came off the field. way too much this year). Chone Figgins threw the ball to Justin Smoak and I was actually sitting right over the dugout in the first row as the Seattle players jogged in. The recently traded Smoak had the ball in his glove and I didn’t even have to stand up… nobody else cared about the ball. “Justin! 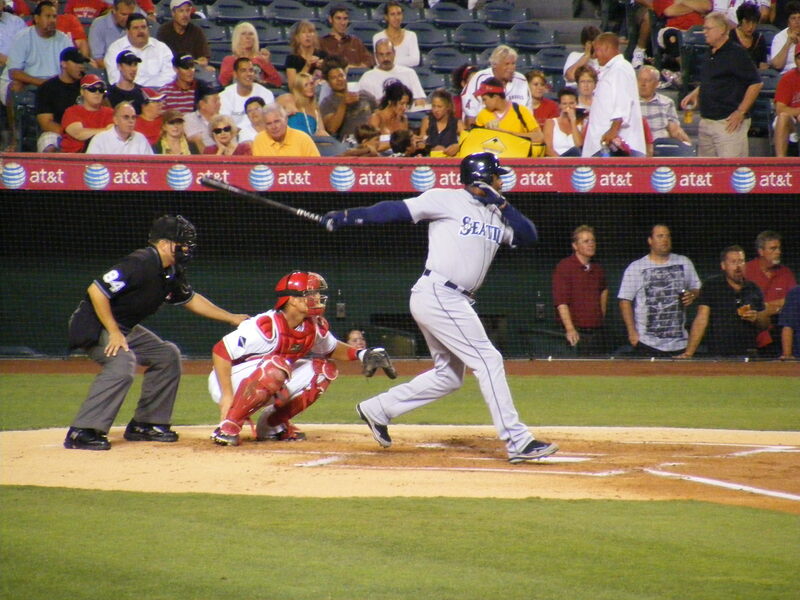 Right here!” I held up my glove and waved it a bit–Smoak lobbed the ball, it bounced off the dugout roof and right into my glove. 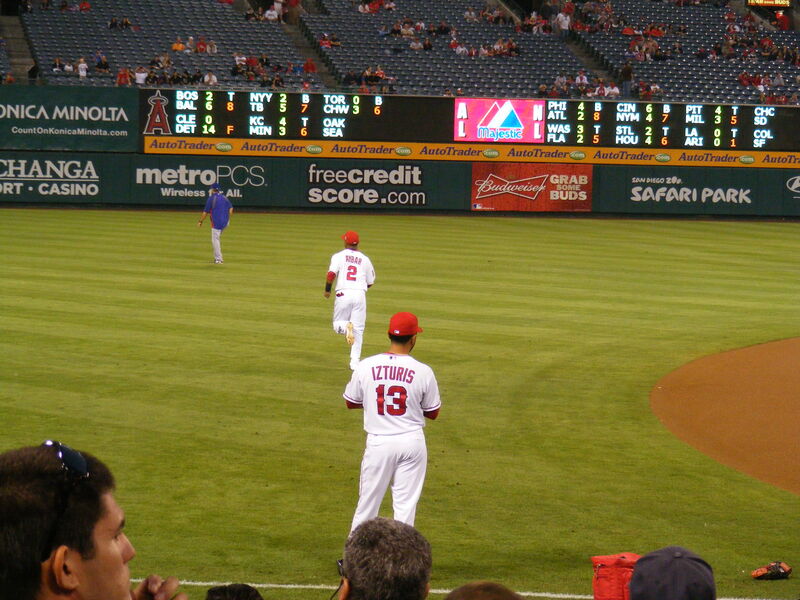 Neither of those guys is Smoak, in case you were wondering. 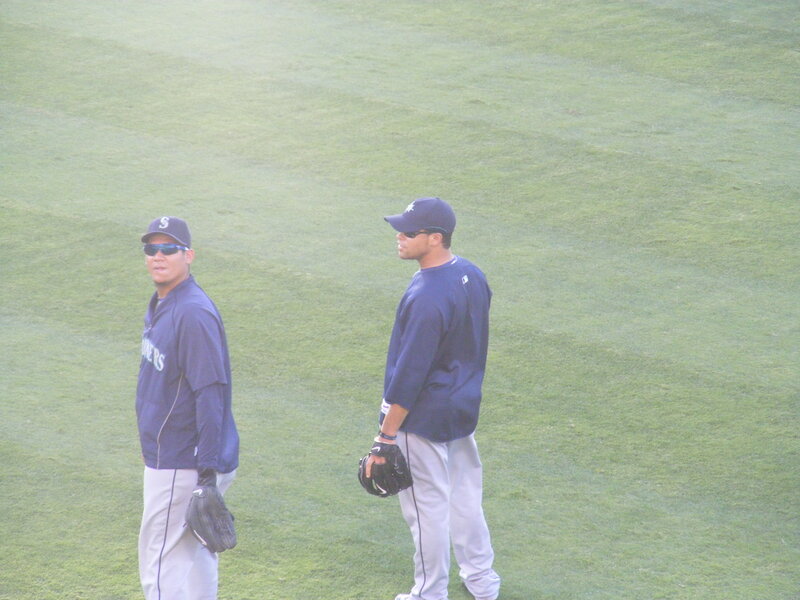 Those two guys are Michael Saunders and Franklin Gutierrez but you get the idea: I was right there. A moment later I jogged back to Michelle on the Terrace Level. We’d end up moving down to the Field Level in the middle innings once the crowd had been established and we could see some open seats. I was hoping for a foul ball but none came near us. It was a fun game and pretty relaxing. I’d never been so glad to see an attendance of “just” 41,000. 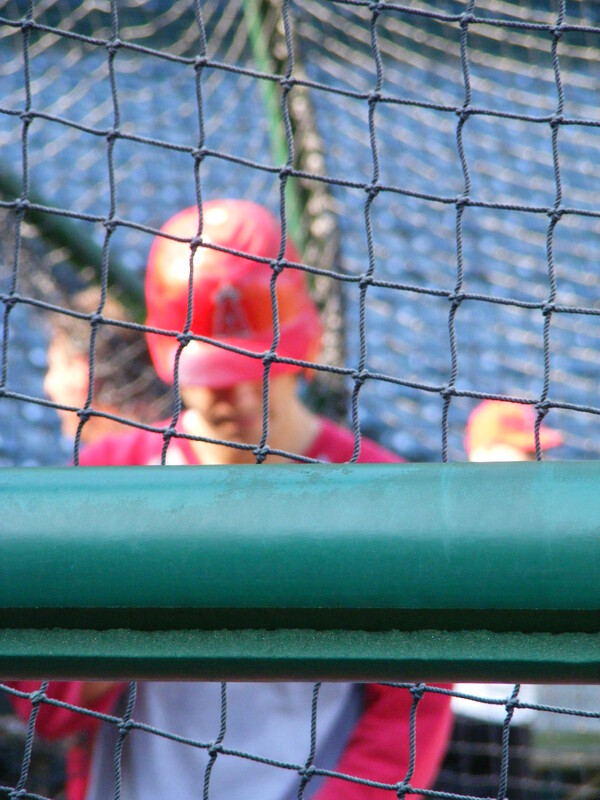 I tried for a toss-up behind the dugout as the Angels came off the field but came up with nothing. 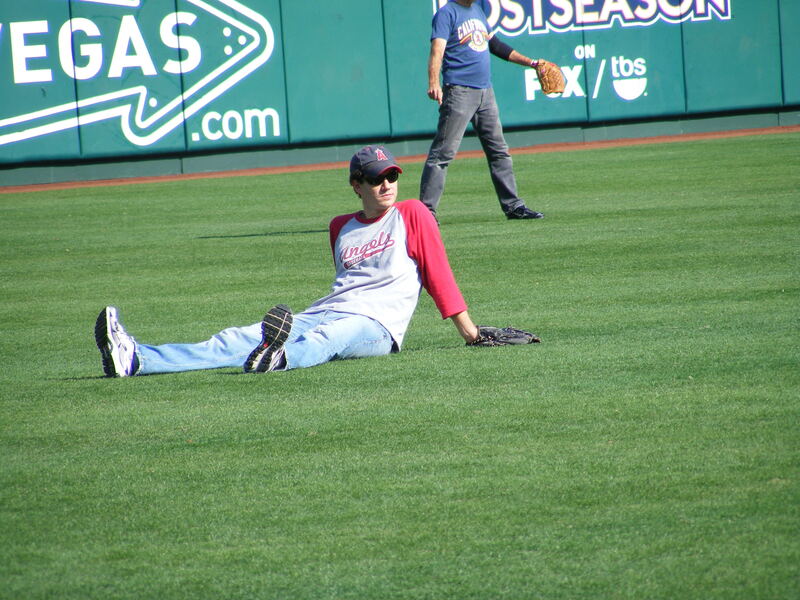 After this game I took a well-deserved two-week break from attending games… I realized I was pretty darn tired. 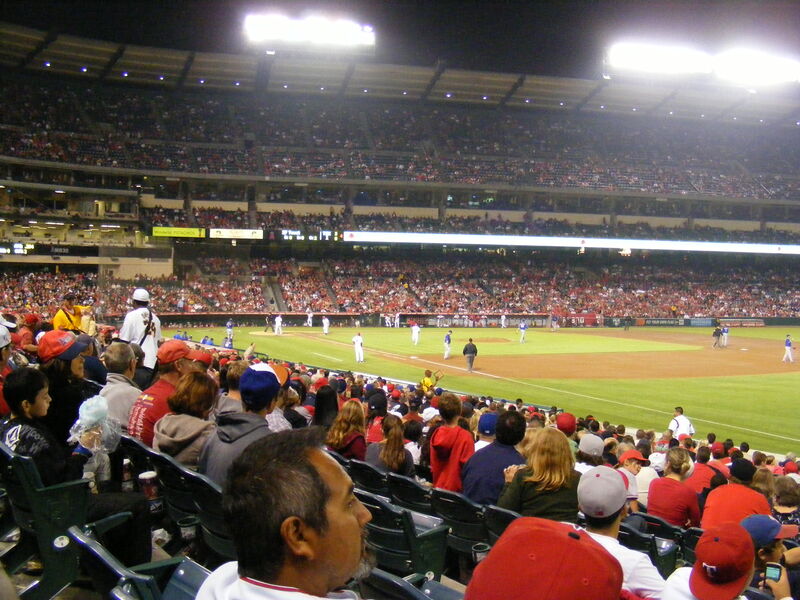 Still, a fun win to see… 8-3, Angels. My next game would be at the end of the month, right before my birthday. This was it! The big game. This was the game fans in Southern California had been waiting for since it was announced. 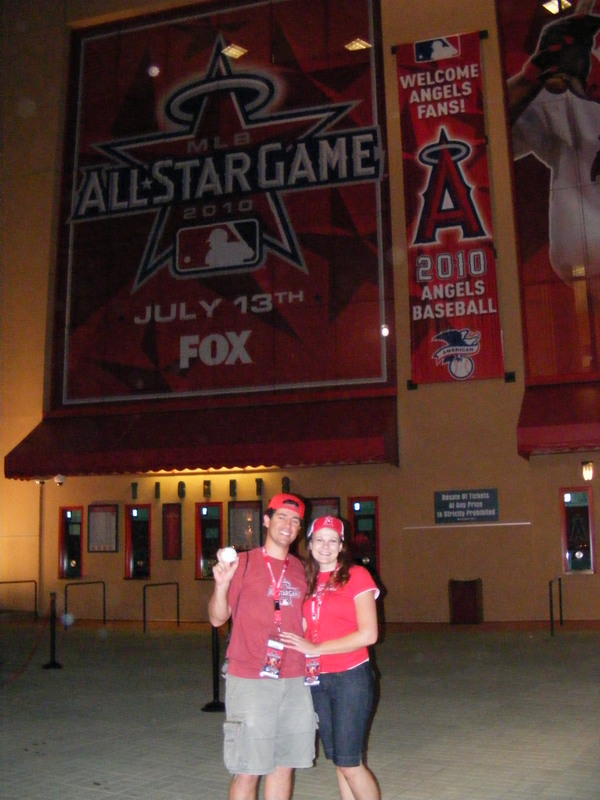 The 81st Annual All-Star Game was going to be taking place and I would be there (with my lovely wife in tow). 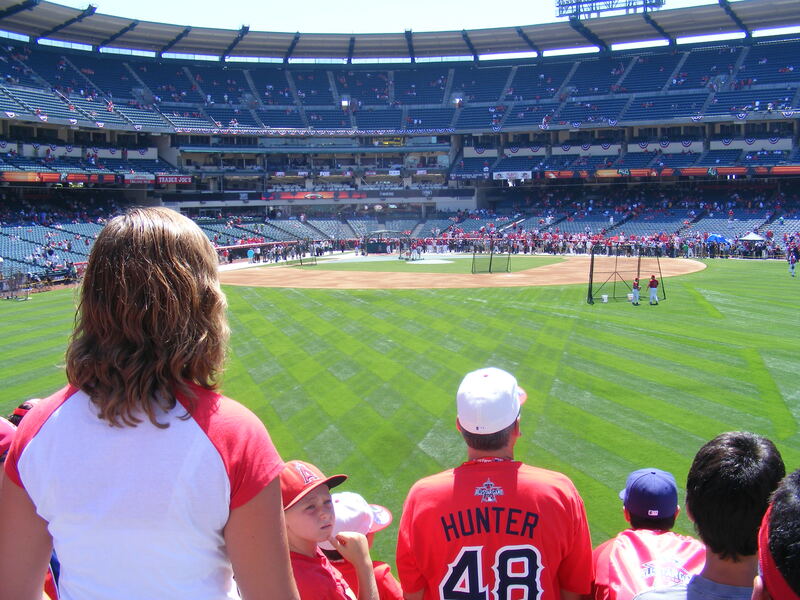 The Home Plate Gate would open up at 2:00pm for the scheduled 5:00pm start time and we got to Anaheim at 12:45. 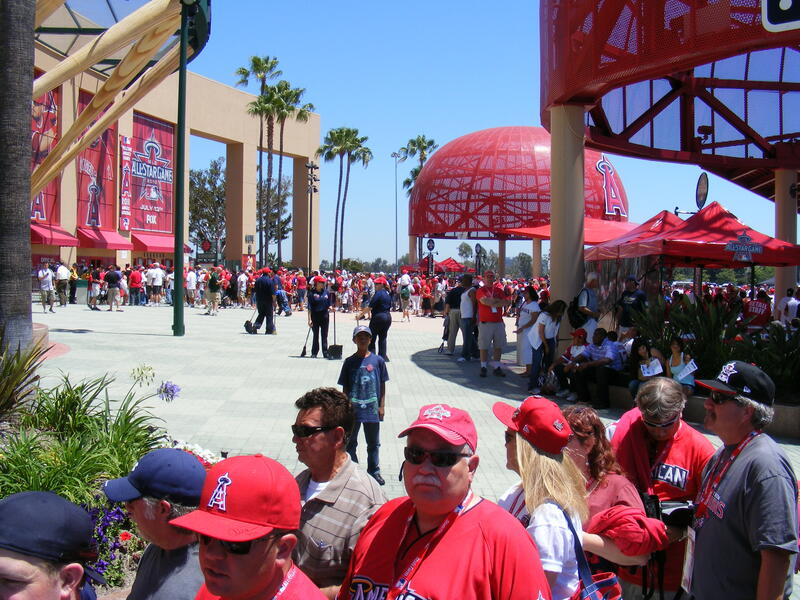 By the time we parked and walked to the gates there were lines forming underneath each of the big hats outside the ballpark. one of the lines and they let us slide into line along with them. Thanks, guys. We chatted for a while to pass the time and noticed we’d be receiving another giveaway upon entering the stadium. For the Futures Game and the Home Run Derby we got ticket-holding lanyards. Today it looked like–yep–we’d be getting a drawstring backpack. Nice! out to the seats that they’d be in use during batting practice. Once I arrived I knew the crowds would get pretty large very quickly. I hoped to get on the board as soon as possible. I was psyched! 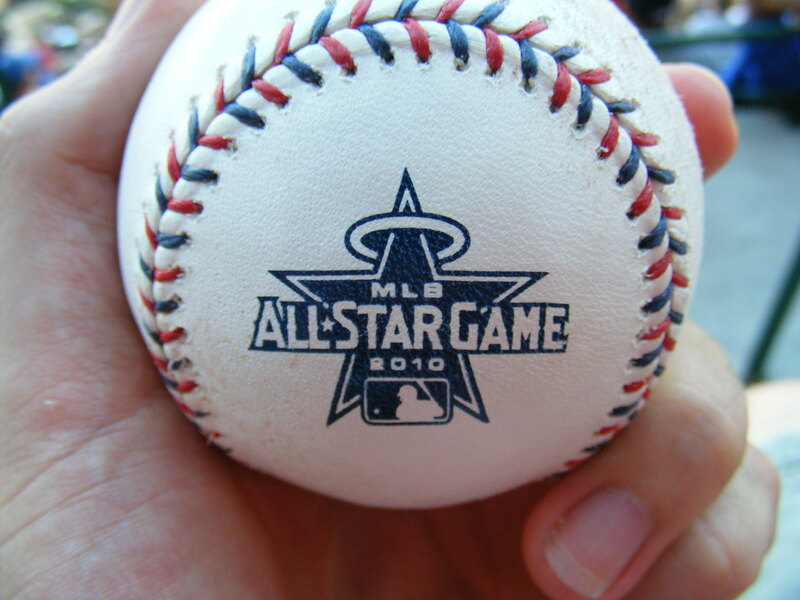 It was a beautiful, red-and-blue-stitched, All-Star ball. It had a scuff on one side and a grass stain below the logo but I didn’t care. 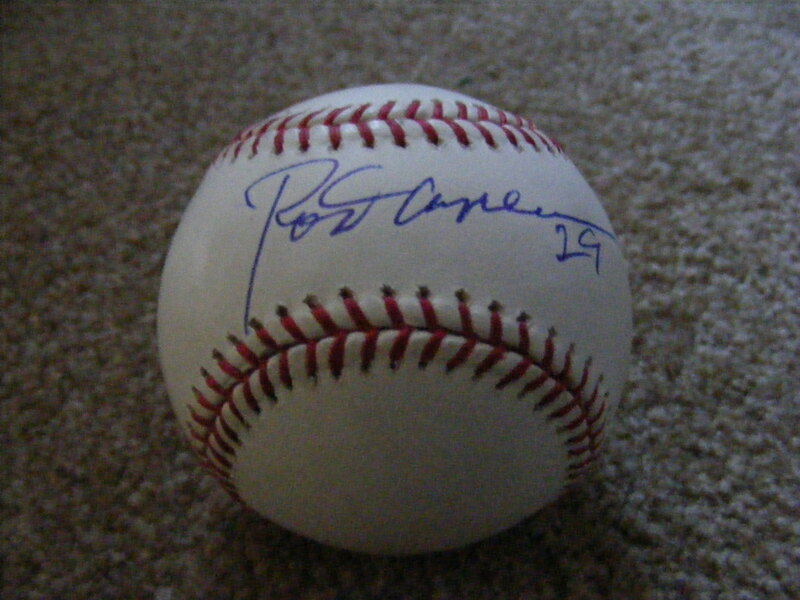 It was mine–and it had been thrown by an Angels player and I couldn’t have been happier to snag it. empty and another once the crowd had grown. Soon, there was little room to run. 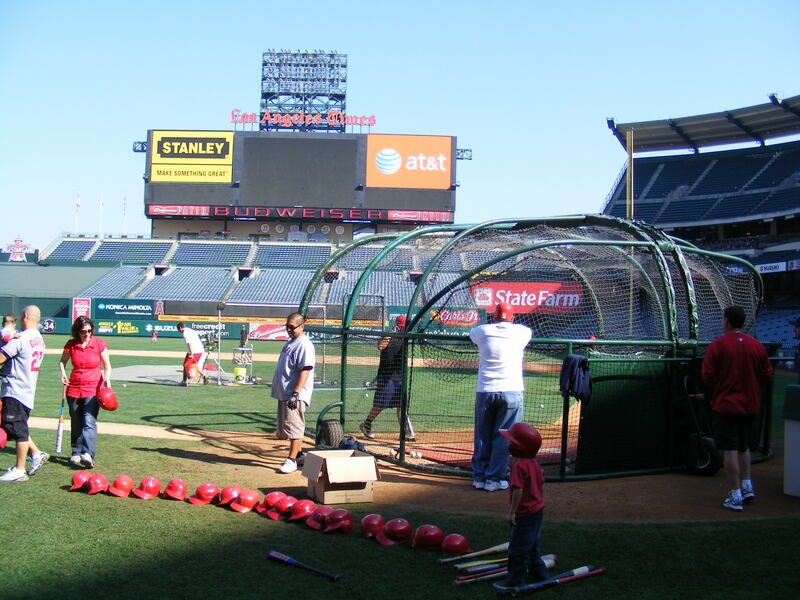 BP wasn’t as packed as the Home Run Derby the day before but it sure was tough to maneuver up in that pavilion. I played the staircase separating Section 238 from Section 239 as the American League hitters continued their portion of BP. People all around. 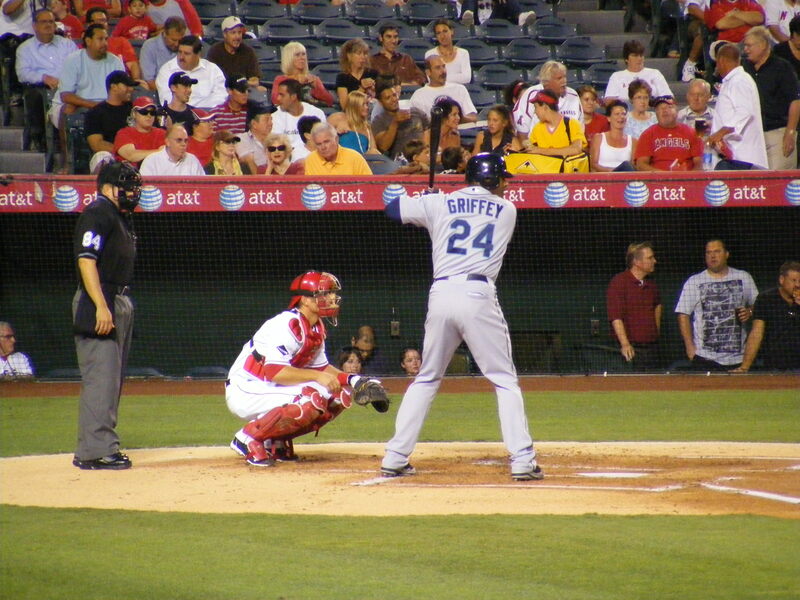 A lot of people let their guard down when a righty stepped into the cage. 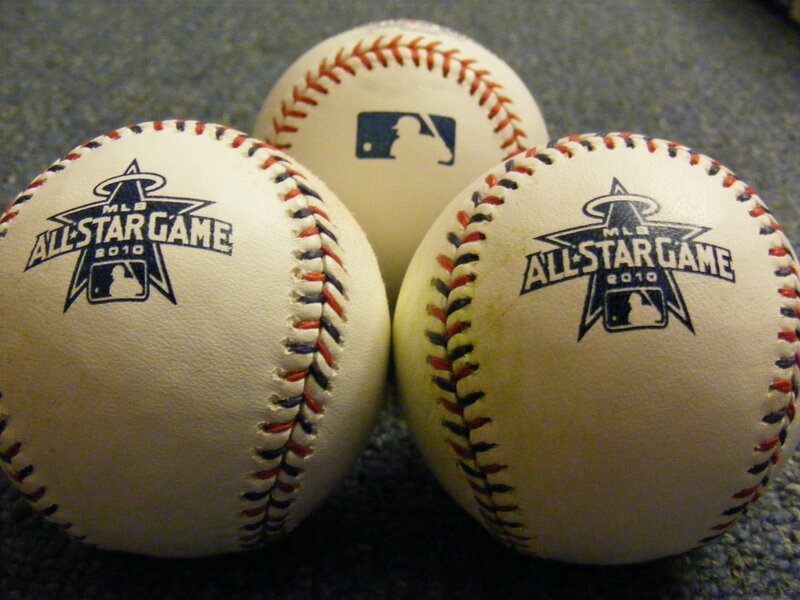 I knew better–especially when a certain righty named Alex Rodriguez was smacking the ball all over the field. I turned around and saw Michelle standing in the row right behind me. 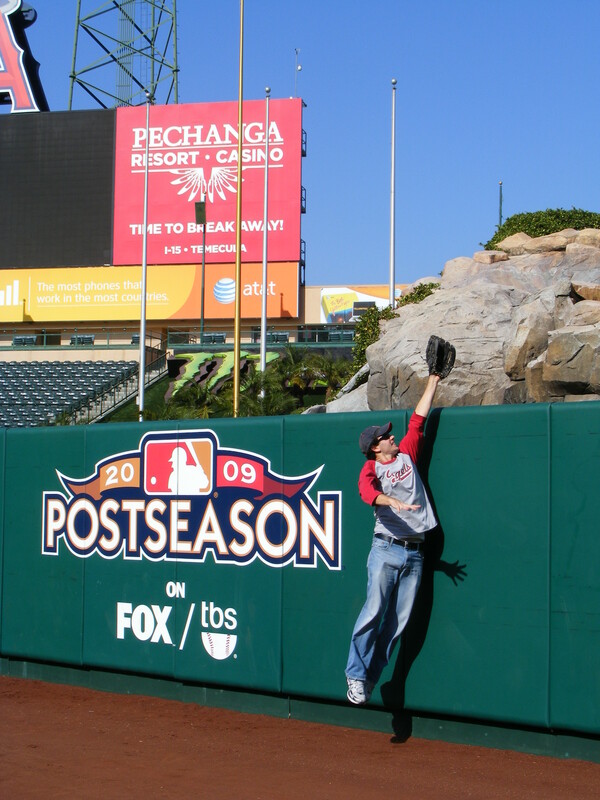 She’d arrived at the tunnel above the right field seats just in time to see me make the catch. It felt great knowing that she saw it and was proud that I’d managed such a difficult (and highly contested) snag. It was a a pretty cool feeling! 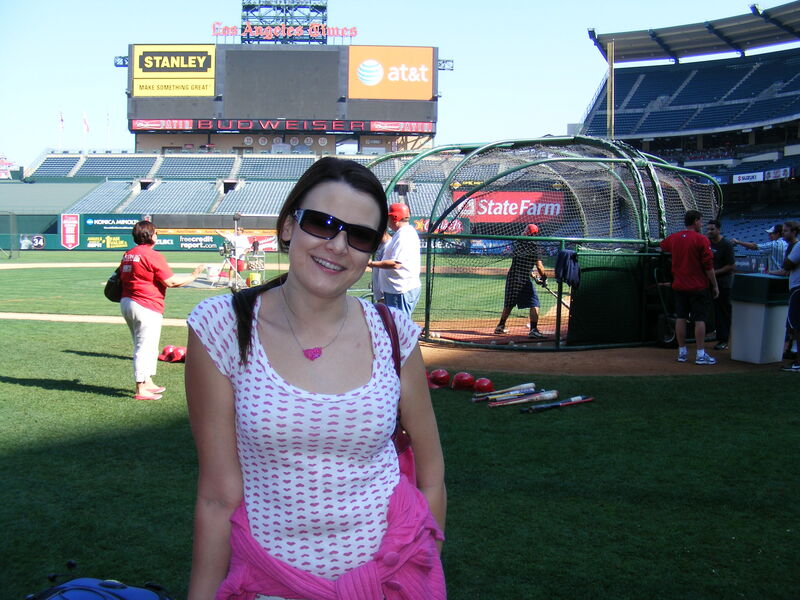 She chatted with me for a minute and then decided to get out of the July sun–I’d meet up with her after BP. 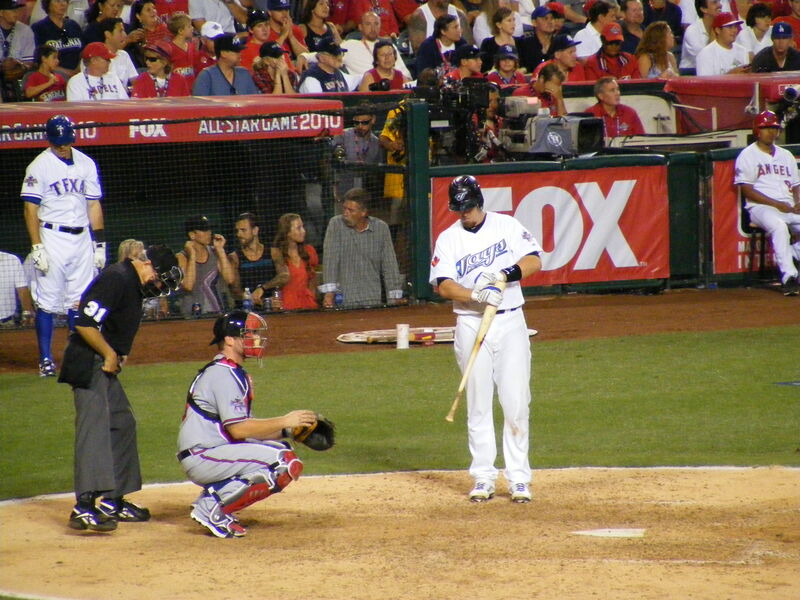 When the AL finished hitting there was a gap of very little action on the field. 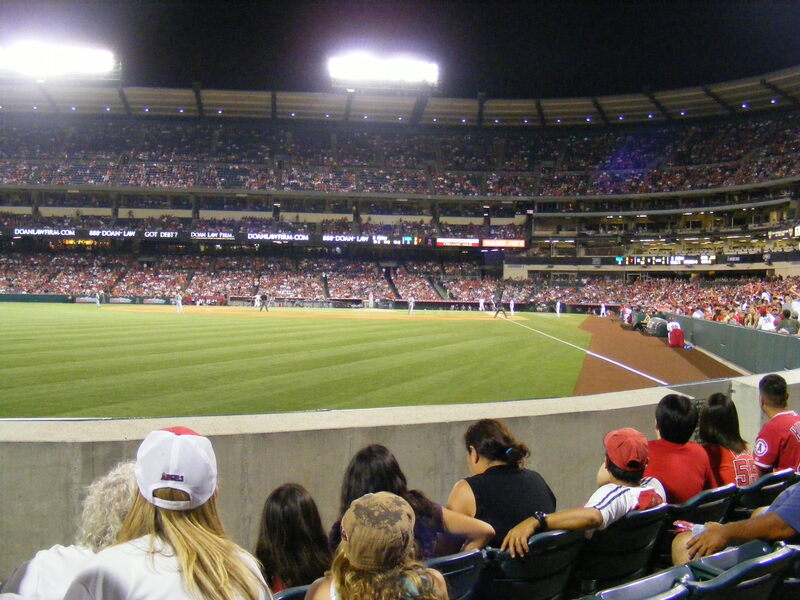 Did you notice the stage set out in center field in the panorama above? Well, it was there so the teams could be photographed. 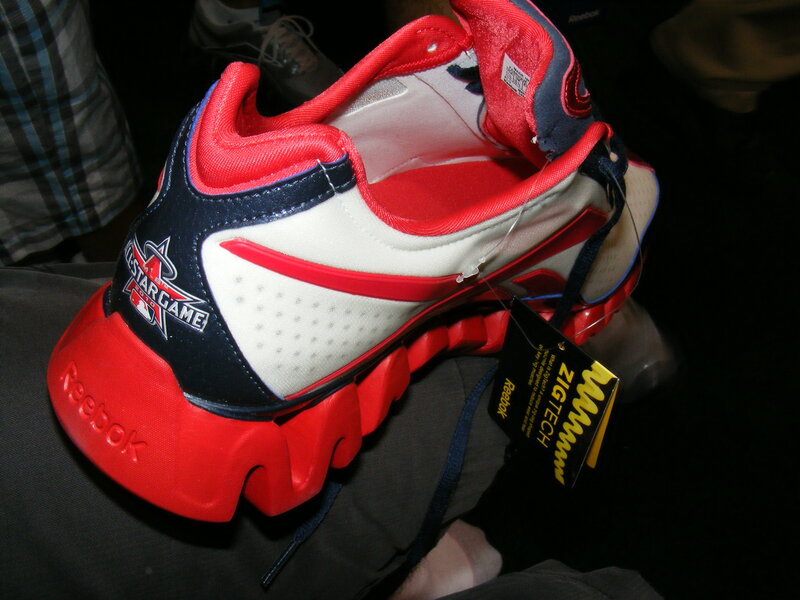 I just noticed this now… but Andy Pettitte and David Ortiz are wearing those shoes I tried on at FanFest. Hmm. 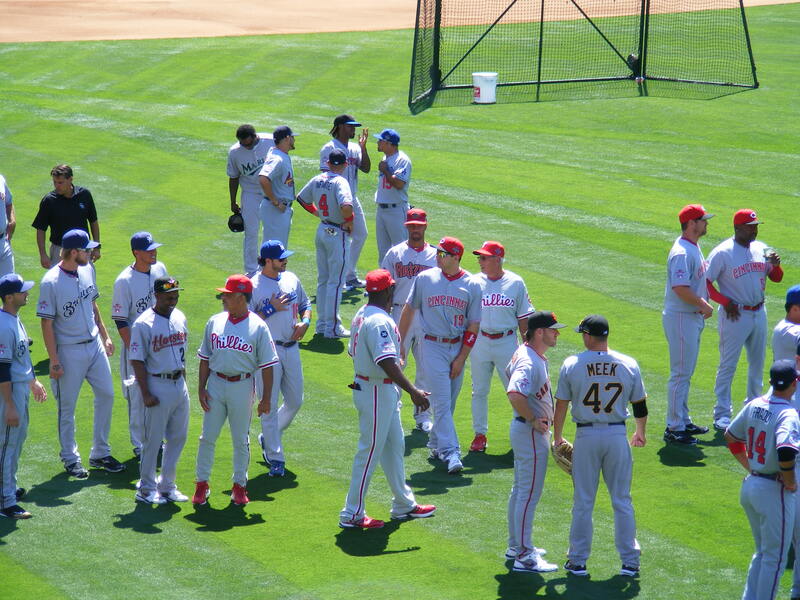 The National Leaguers came out to the field to take their photo right after the AL was done. would be a toss up from a player. I told him that I would, in that case, stand in the space directly in front of thirteen. He told me that his whole family had seats nine through sixteen. I told him that I would move when they arrived. He grumbled something to his friend. over by the right field line. People to my left and right were asking for the ball. I said, to the kids on my left, “He’s warming up… you have to wait until he’s finished.” I knew what I was talking about–and when Capps finished (and his throws were getting shorter) I yelled out, “Hey, Matt! My name’s Matt, too, and I’d love to get a ball from you, sir!” Capps looked up, checked the baseball in his hand, then looked right up at me and tossed the ball straight up. force… ordinarily not a big deal since I wear my glove on my left hand. However, there was so much force behind the push that it shifted my frame a few inches down and to the right. 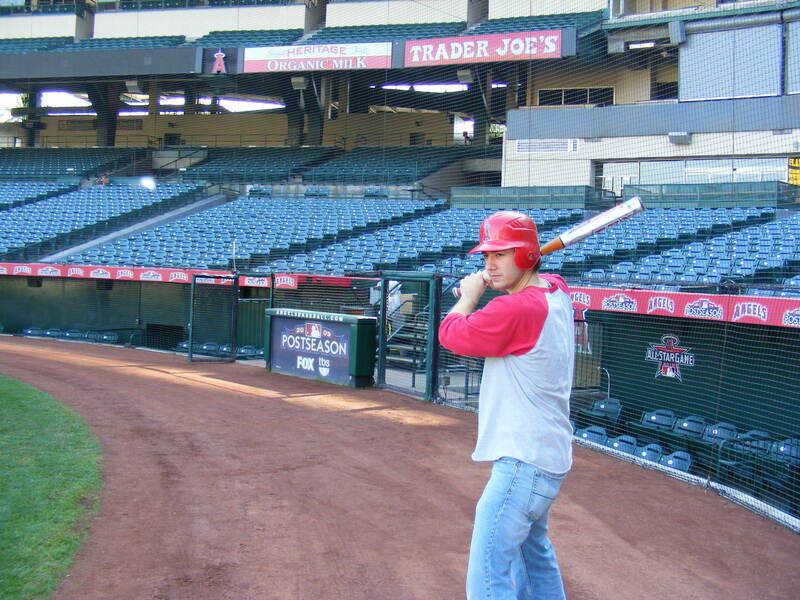 I watched the ball sail inches over my glove and past my left shoulder into the row behind me. I desperately tried to grab it from the second row but it bounced away from me and a fan in the second row ended up with it. I was furious. I knew what had happened… I spun to the teens on my right and stared at the two of them. Frustrated, I said, “OK, which one of you guys pushed me?” They both looked down at the railing in front of them. I asked again and, again, they stared straight down. I turned my attention back to the field and said, “That’s not cool, guys. You can’t just grab a guy’s arm like that.” I was pretty pissed… but I was even more determined to snag another ball at that point. Like, if they had accidentally bumped me, OK, I’d be all right with it. But this was intentional snag sabotage. Not cool at all. move from his family’s seats. I asked what ticket he had. He showed it to me. 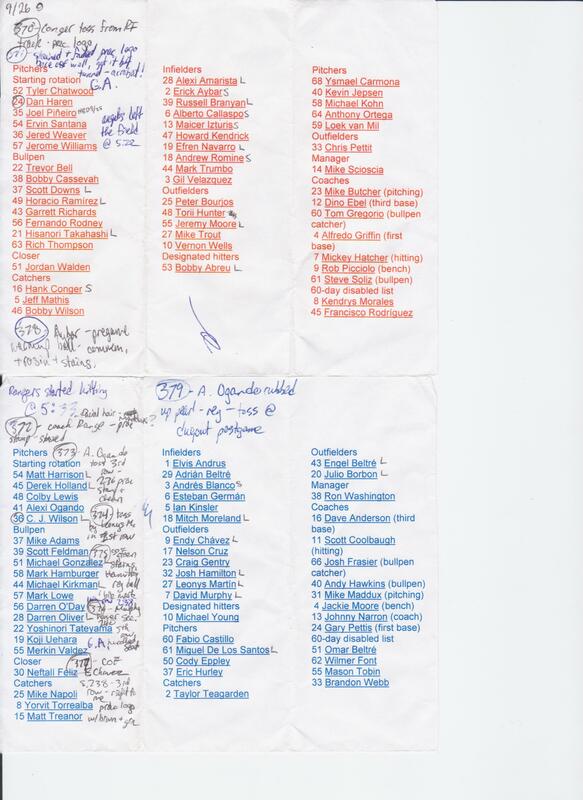 He had seat nine… remember, I was in the space directly in front of thirteen. I told him he should tell the kids on my left to move out of his seat then. 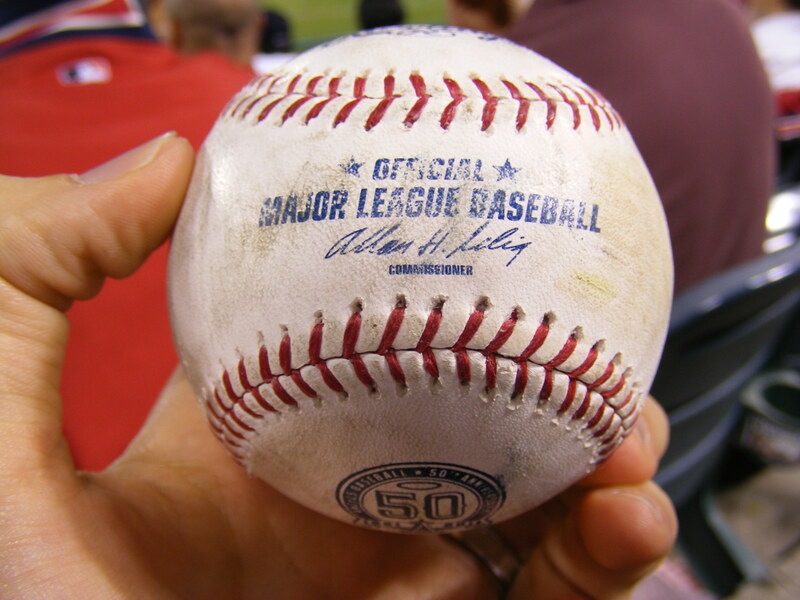 that by asking him in Korean for it (thanks, Zack Hample). When I caught it, I saw it was commemorative and then showed it to the kids on my right. and two to the upper deck. 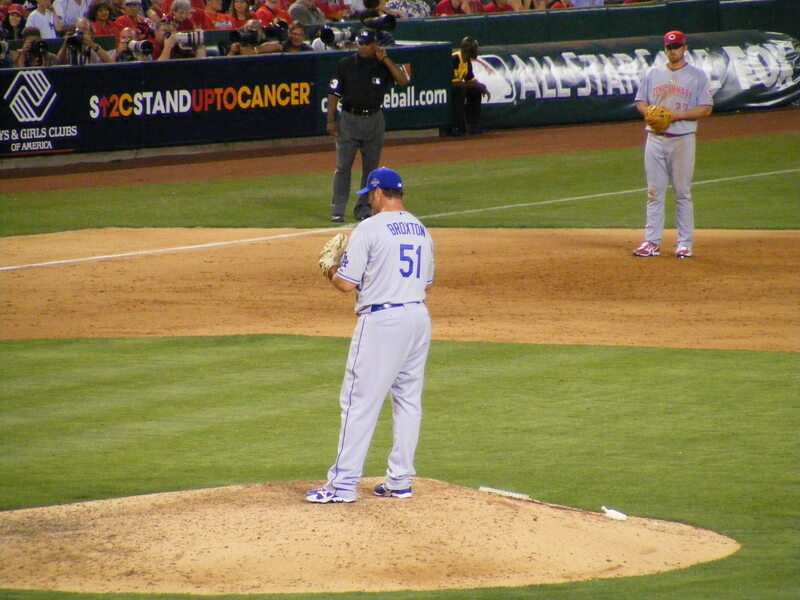 Sadly, none came to me, but it was still pretty cool to witness, well, that type of coolness from Heath in person. It turned out that they were in the sun. Bleh. I didn’t crop this photo so you could see all the fans that had already arrived. Also, down in the bottom-right corner you can see a line of people holding a giant American flag for the opening ceremony. 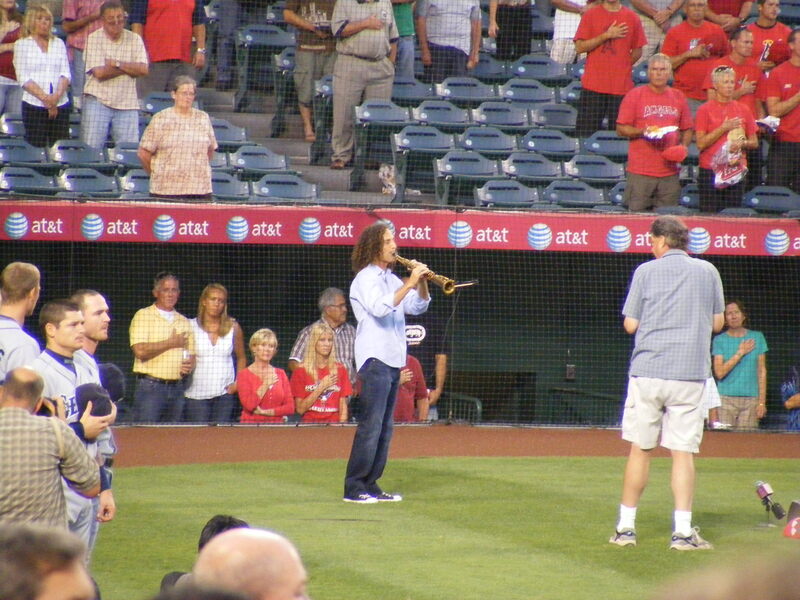 Among Us.” And one of the cast members from GLEE sang the anthem–but they were having sound issues within the stadium. Did it sound all right on TV? There had been sound issues on Sunday and Monday, too. 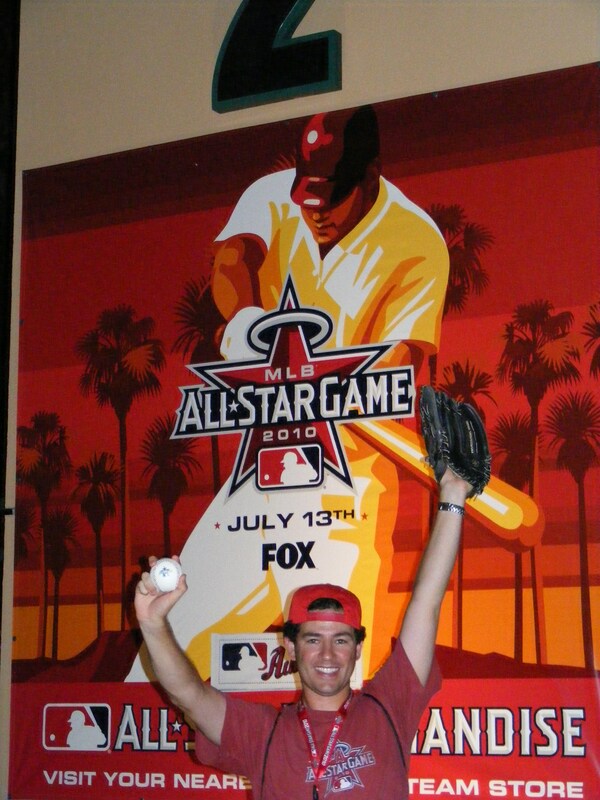 I was totally thrilled to be watching an All-Star Game! We were far from the action but the environment was great! The game was tense throughout. I could tell early on that the game would be a pretty low-scoring affair. Each team’s pitchers would dominate the game… and it helped that Ryan Braun made an outstanding catch in the middle innings. 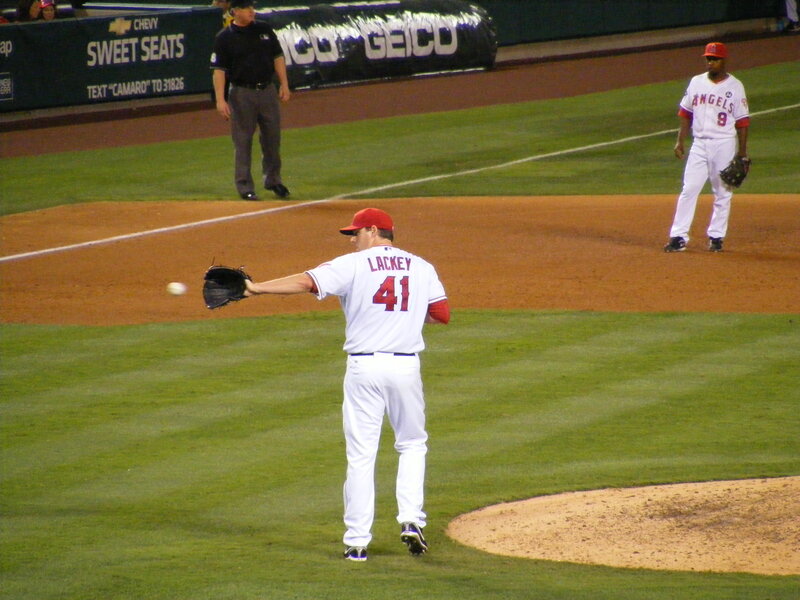 And, did you know that Cliff Lee only threw six pitches to retire the side in order in the fourth? Thornton allowed a bases-clearing double to Brian McCann. To his credit, Marlon Byrd kept the inning alive with a walk while McCann was on deck. second base. 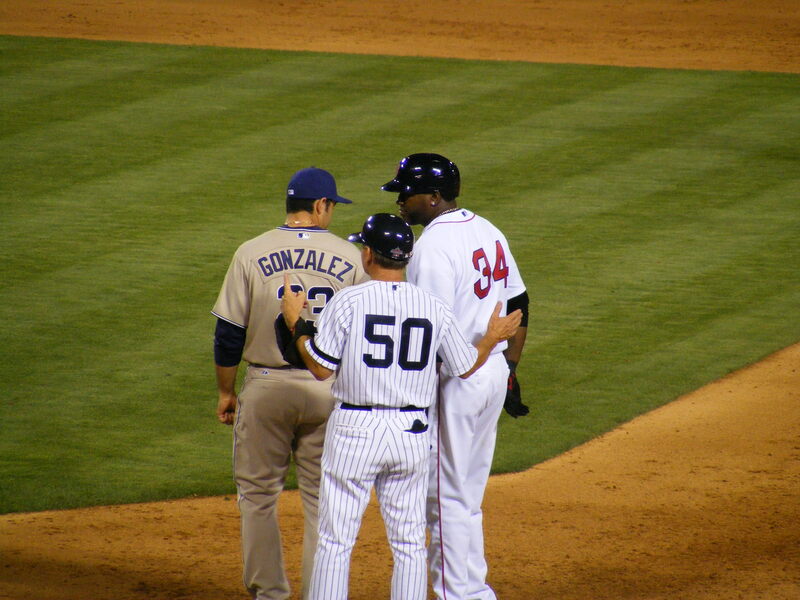 Why wasn’t A-Rod in the game to run for Ortiz? Or, why didn’t A-Rod hit for somebody? Oh, well… again. 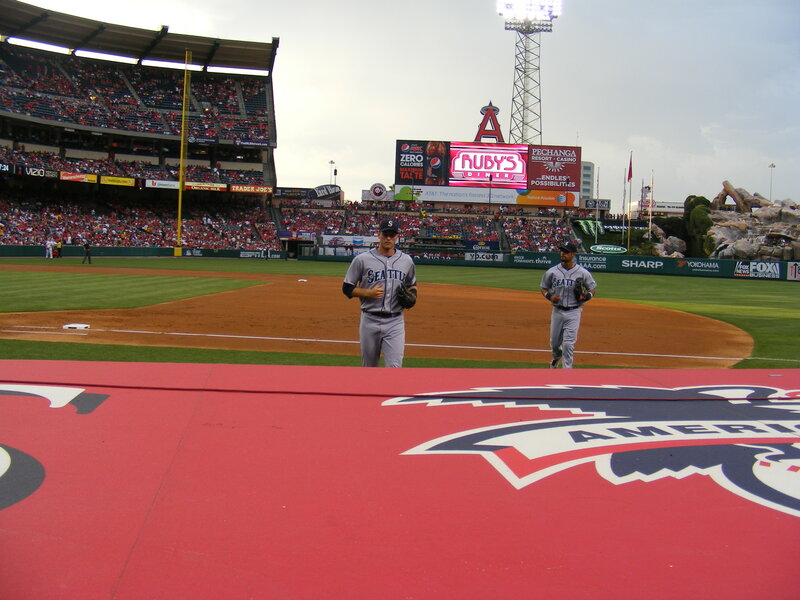 For the ninth, we were down on the Field Level, hoping for an AL comeback. 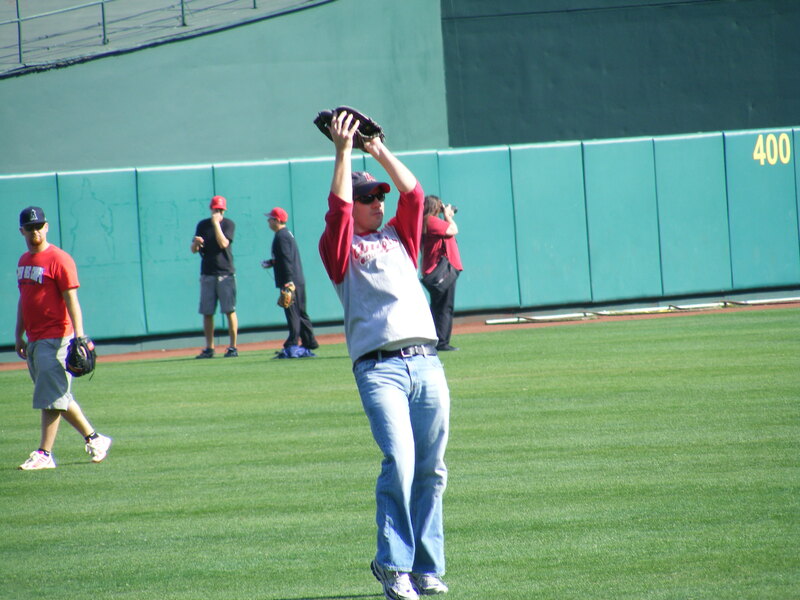 I left Michelle for the last half of the inning and I managed to get in a great position for a toss at the end of the game. 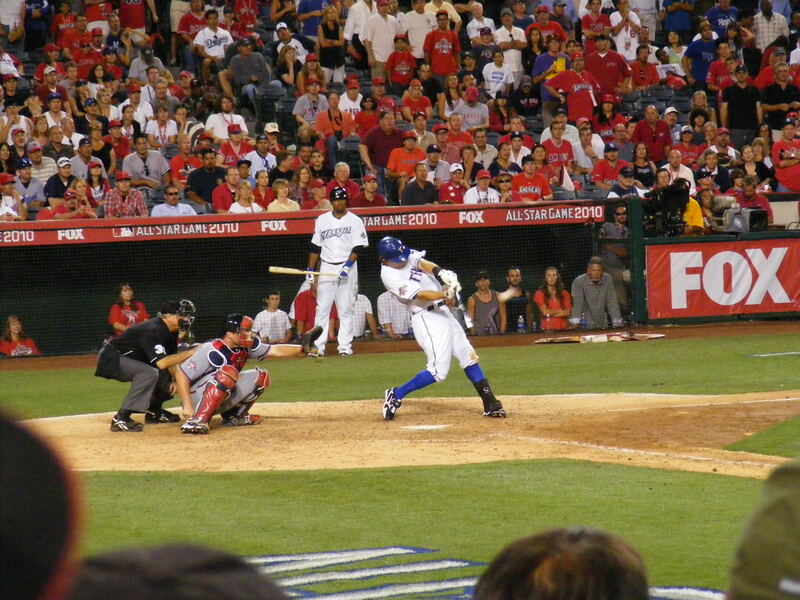 And Ian Kinsler smacked a ball into the right-center field gap that hung up just a bit too long. 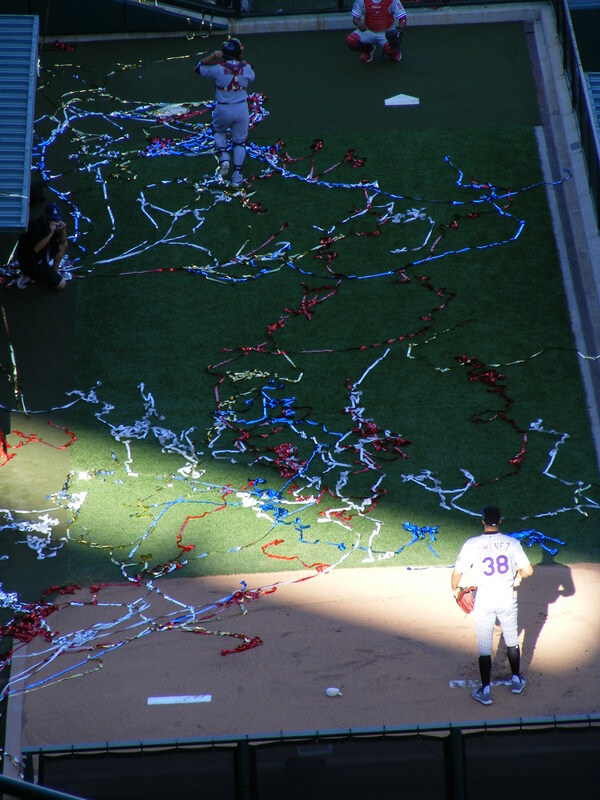 And when the NL wrapped it up I was right above the dugout, first row, and I did everything I could to get a player to toss a ball up… but no one did. 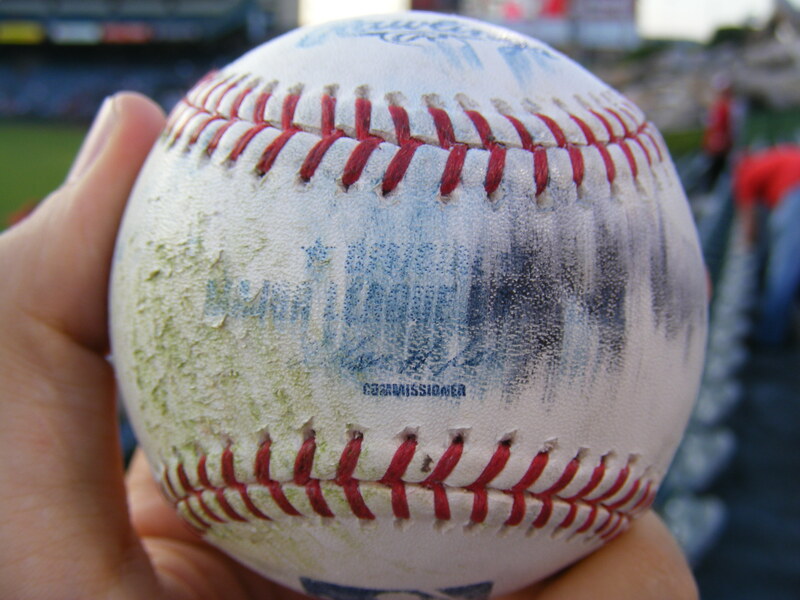 Jonathan Broxton was interviewed while the final out ball rested in his glove. He kept it (I figured he would) and that was it for toss-up possibilities. It was okay though. I had really enjoyed the game. 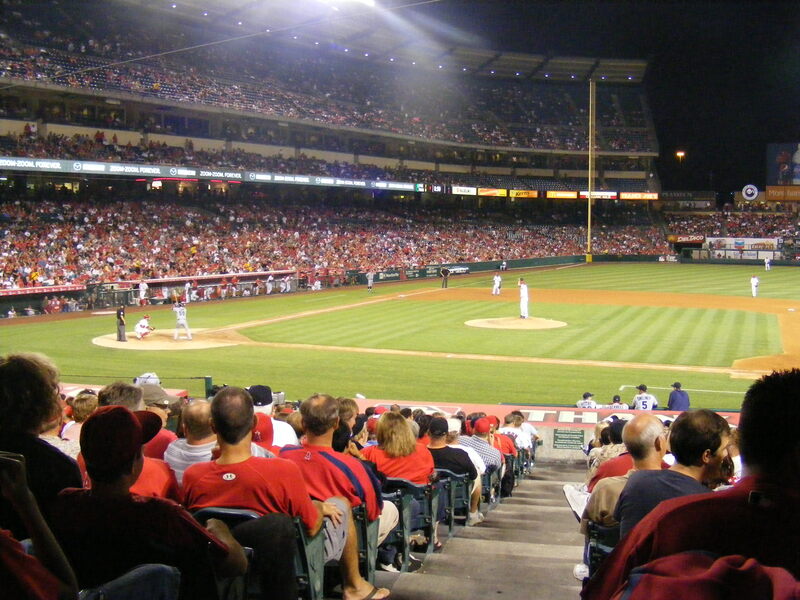 get to come back (to a less crowded stadium) pretty soon. 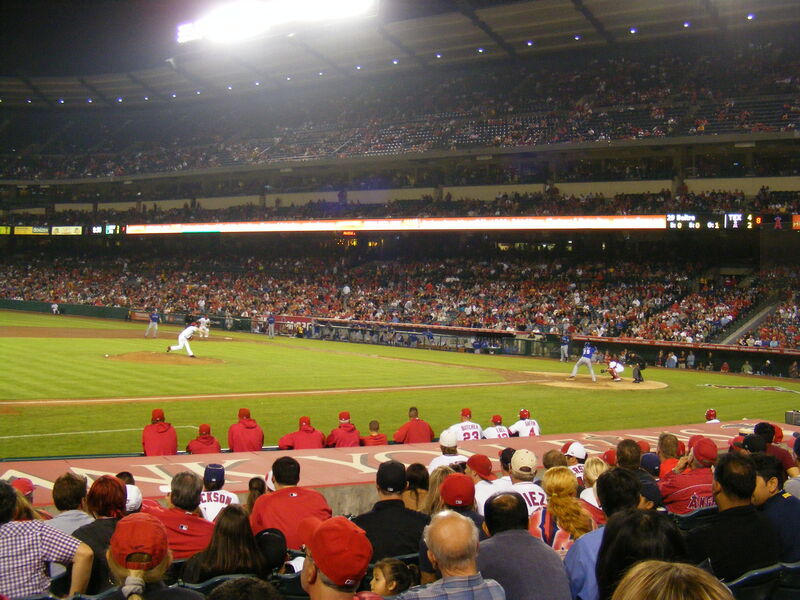 Back at the beginning of November I read a little press release on the Angels’ website. 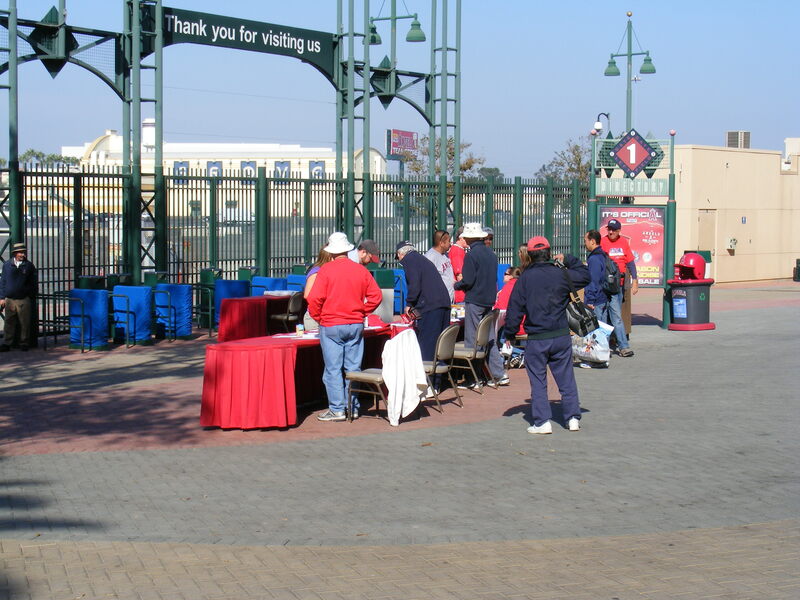 Basically, the groundskeepers hold a canned food drive on the weekend before Thanksgiving each year and 2009 would be their 9th annual food drive partnering with Second Harvest Food Bank. At the time I wasn’t sure if I could make it due to my school schedule. 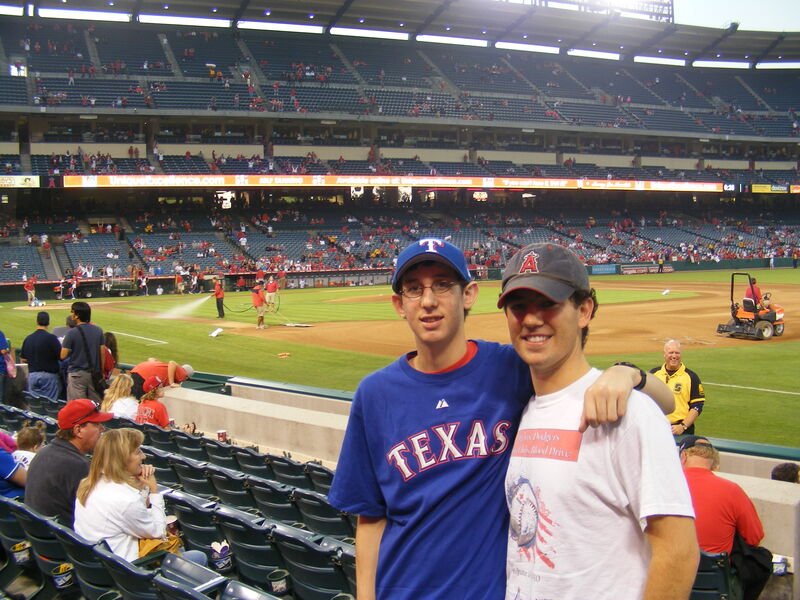 But, fast-forward two weeks and my schedule was remarkably free on the Friday before Turkey Day so Michelle and I rooted through our cabinets, stopped at the store to purchase additional canned goods, then drove to Angel Stadium. We arrived a little after 10:00am and were pleasantly surprised to see there weren’t a million cars in the parking lot. Totally awesome! Like, literally, awesome… I was in awe. 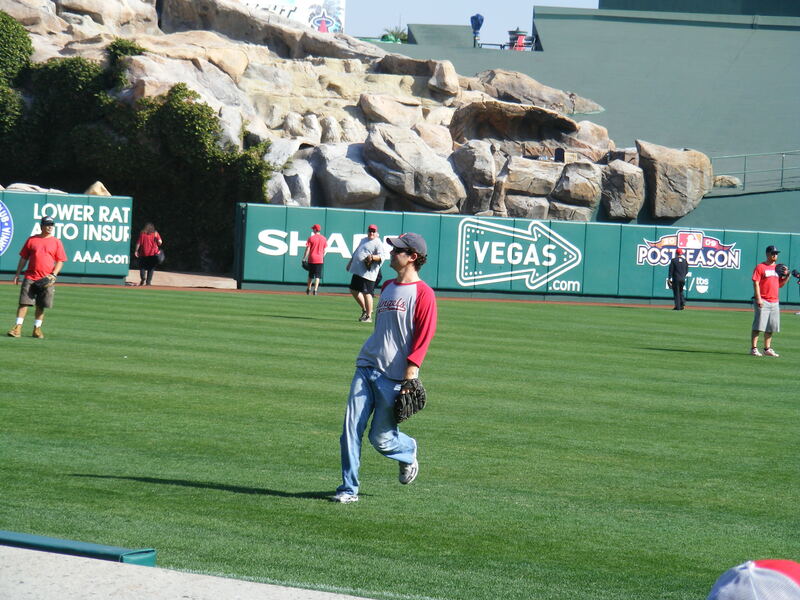 There they were, ordinary fans totally allowed to run around on a big league field! 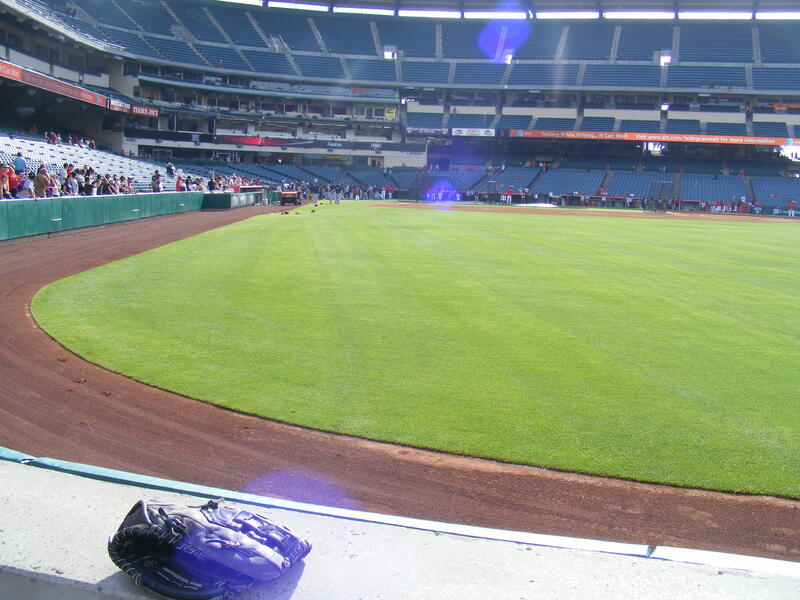 We hurried down the aisle to the front row and into the special box seats that are right on the field. 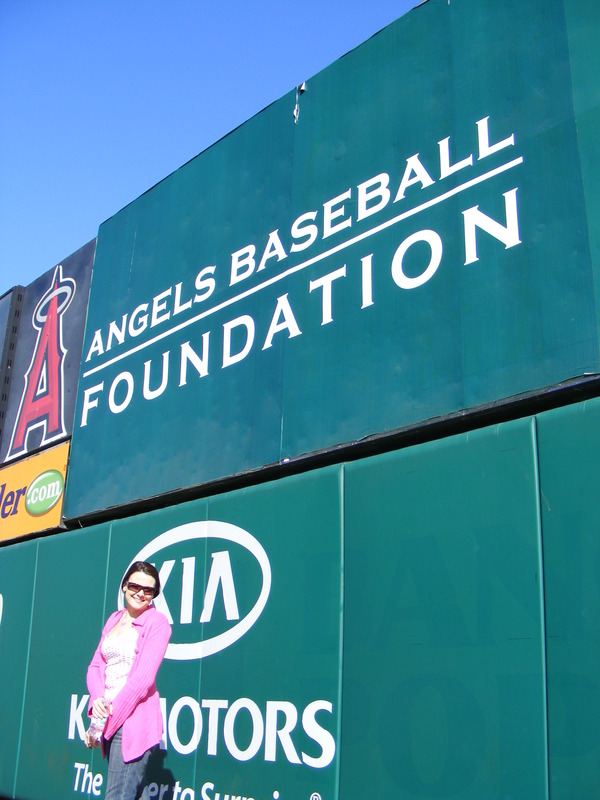 At this point I parted ways with Michelle (she was going to hang out and take pictures) and went toward the half-open gate that led onto the warning track. Everyone who was going to hit had been assigned a number. Mine was 129. I got to the gate leading to the field and hesitated. Could I just head out there? Did I need to wait to be called? I had no idea what the protocol was. 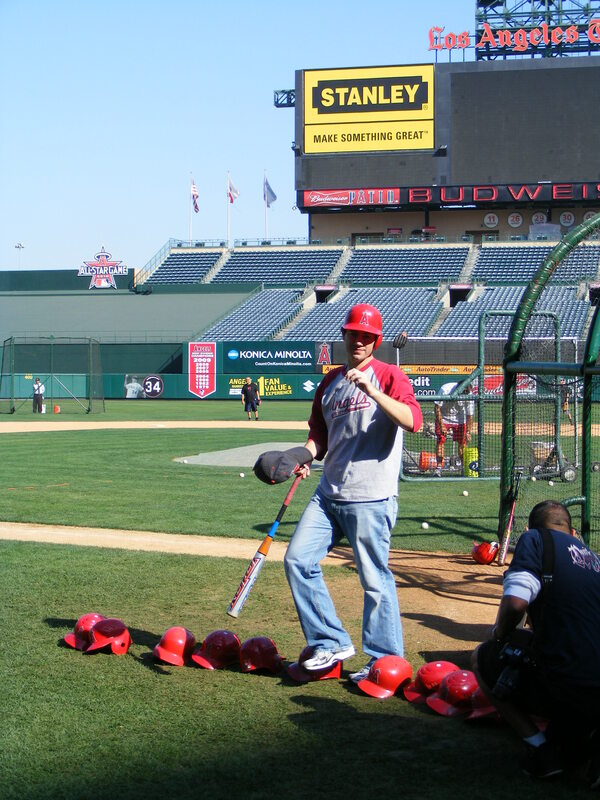 I asked a guy nearby if he knew what number they were on and he told me, “About eighty or so.” Well, considering everyone hitting could get up to 20 pitches I figured I had some time… so I just walked out onto the field. I stepped on the dirt, made it a few steps further to the grass. 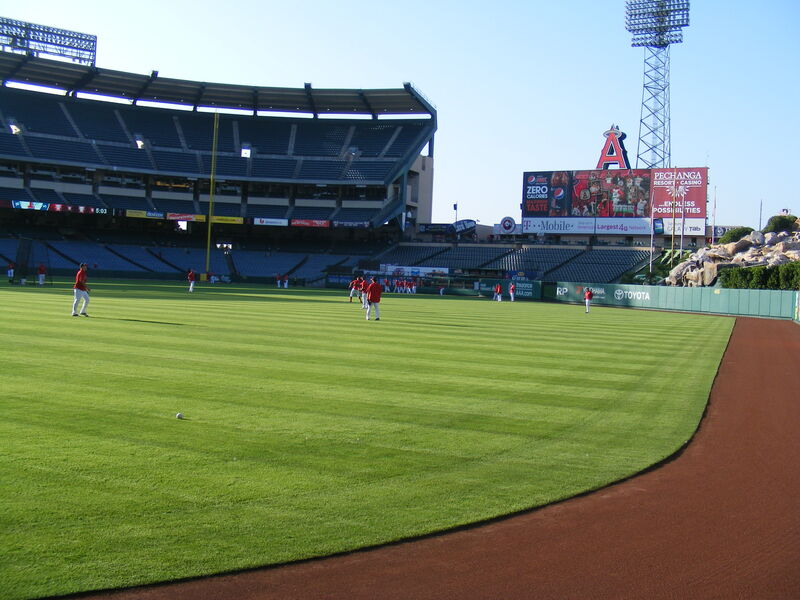 I’d never touched the grass at Angel Stadium before. I kept walking, my backpack still on my shoulders, praying nobody would tell me I had to go back to the stands and wait. 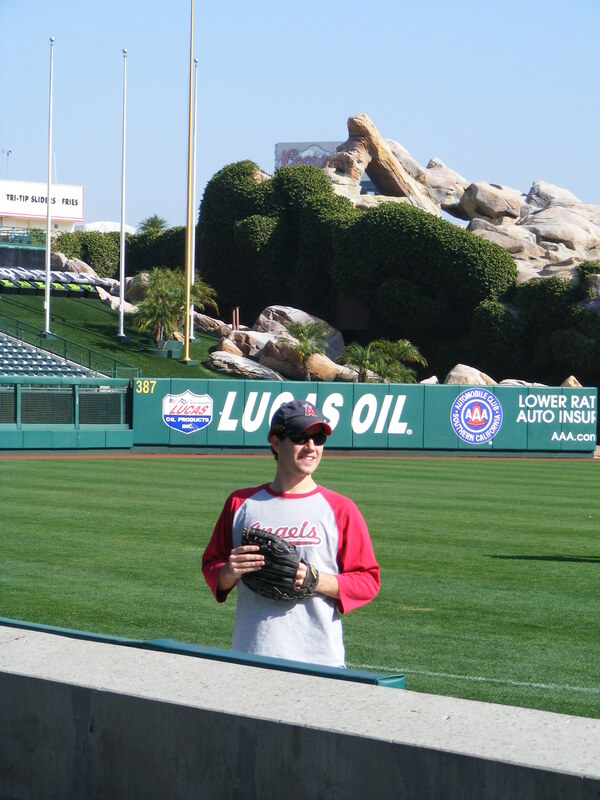 I kept going, made it out to left field, turned around and looked back at home plate, and stopped. Wow. It was incredible! 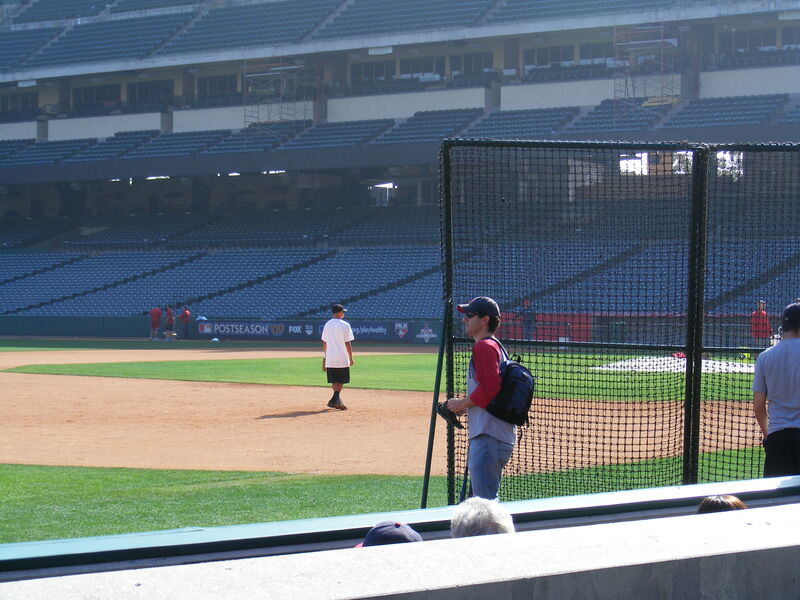 The last time I’d been down to the field was in the early nineties when I got to march around the warning track on Little League Day… even then there was a rope set up to keep us off the grass. I looked back at my wife, already snapping pictures from the front row of seats, and waved. Then I looked around. People young and old were all over the field just enjoying being there. Every now and then a ball would get hit to someone and they’d make a play on it (or, at least try) then throw the ball to one of the buckets. I had been there for ten minutes and I realized I still had my backpack on. 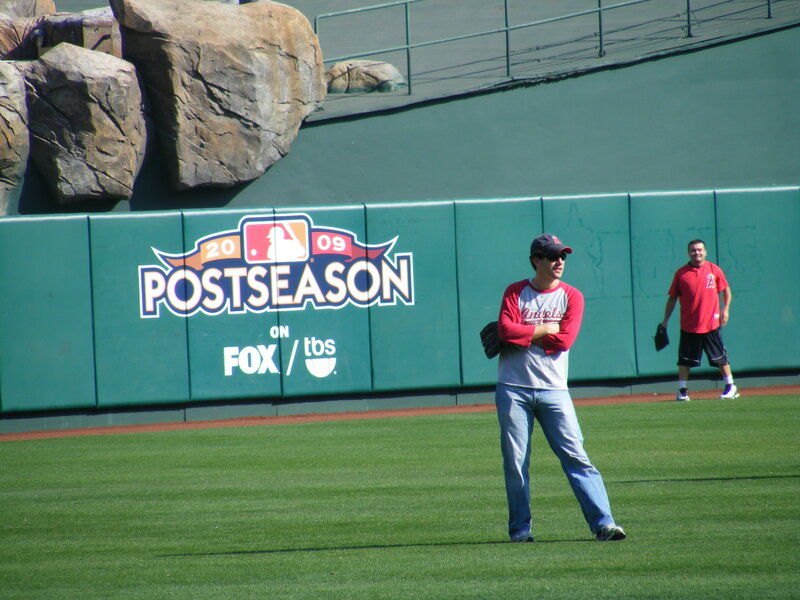 I ran over to the wall near the tarp and set it down, then waved to Michelle again and headed back out, anxious to field a ball. 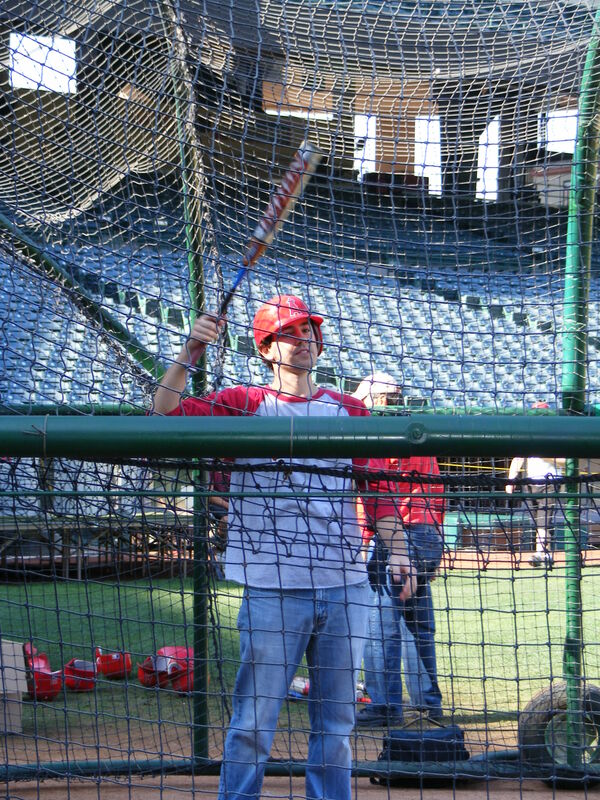 “Well, now I just have to catch one.” I knew well-enough to stay in left field since almost everyone hitting was a righty. 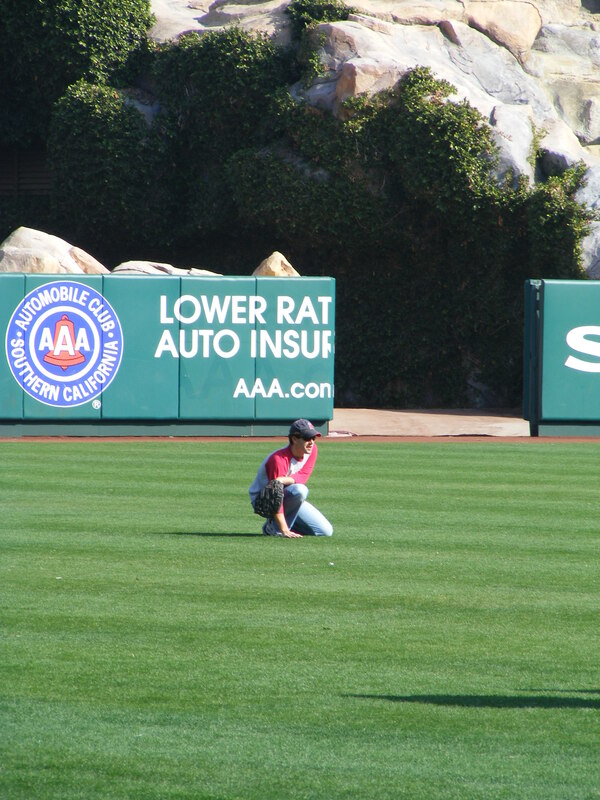 Eventually somebody hit a lazy fly ball that was falling fast in front of me. I ran forward, got under it, fought the morning sun and caught it. It was a great feeling. 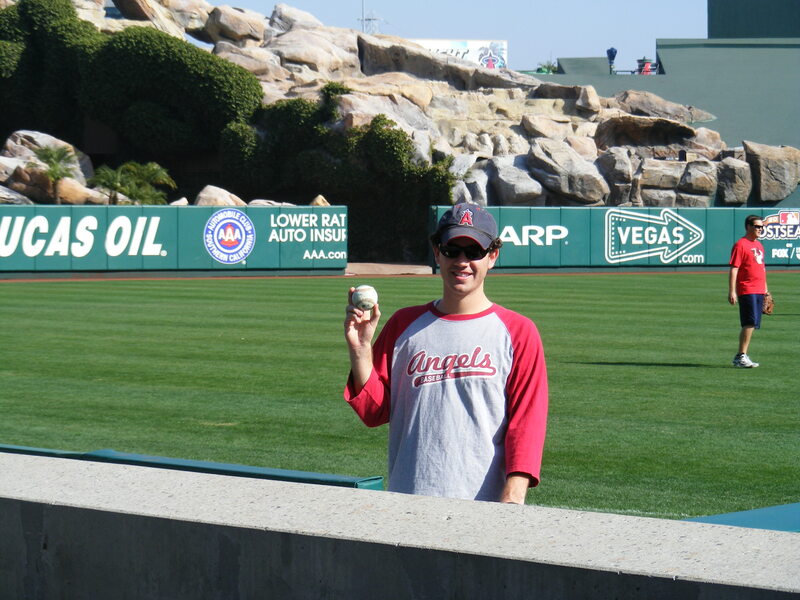 I’d just caught a fly ball on the field at my favorite ballpark. 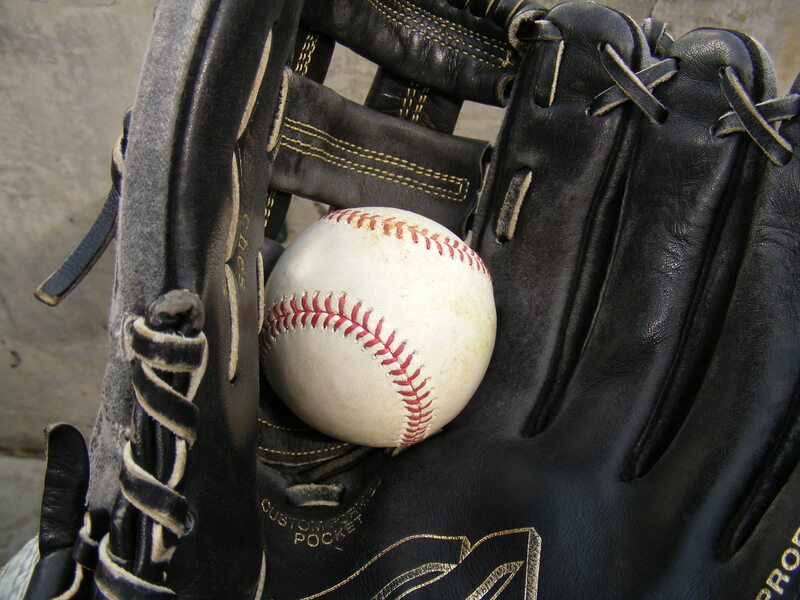 My primary thought had been, “Don’t drop it,” and after it had settled into my glove I was simply thankful. Then another one came… this one a liner. would run back to Michelle and check to see where they were number-wise. It was so much fun! She took a lot of photos. The sun got to be pretty tough but I ended up catching quite a few balls and even fielded a few grounders that managed to get through the infield. 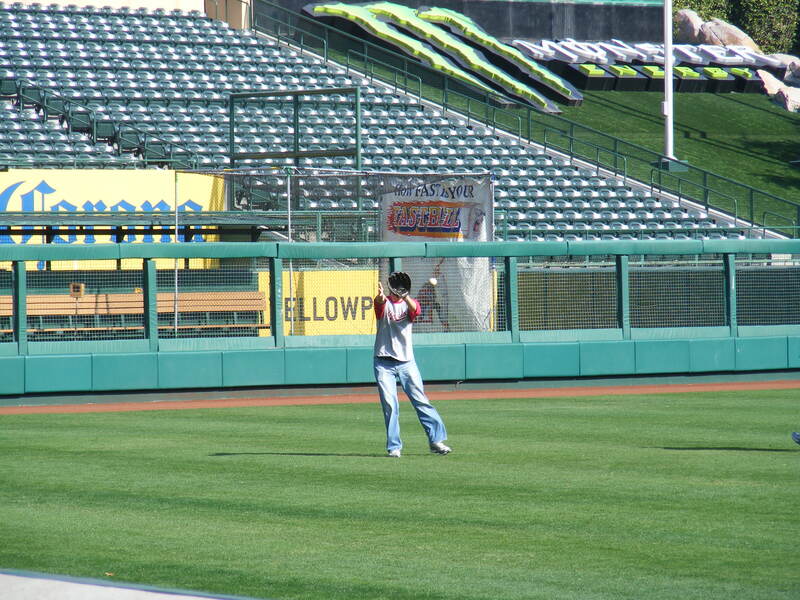 At one point a lefty hit a home run into the corner in right field. It was the first one that had been hit and the only one I saw the whole time I was there. He got a round of applause as he finished his hacks. It was taking quite a while to get to my number but I didn’t care… I was having a great time! 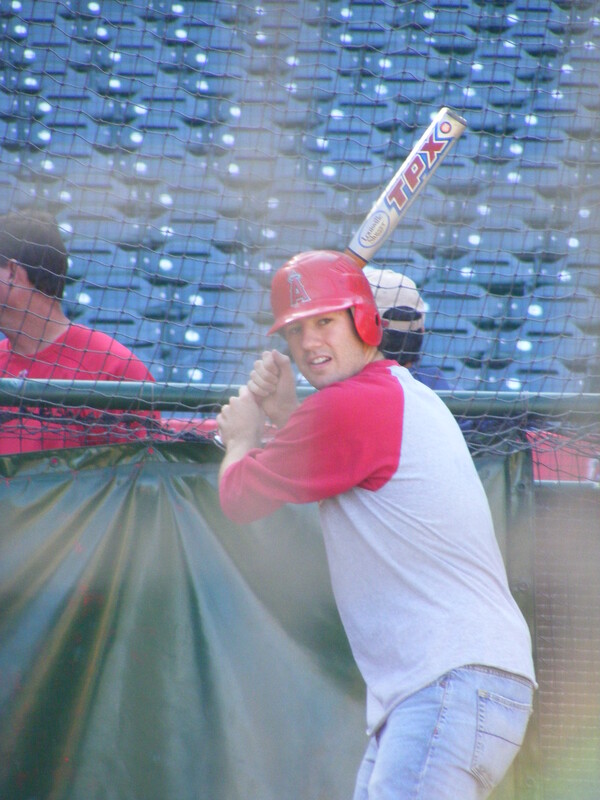 Even when I had nothing to do because the person in the cage wasn’t making contact I was simply glad to be there. At one point a few little kids started to hit and I moved into the infield, right around second base, to field grounders. When the kids weren’t making contact a guy who’d taken over first base threw us warmup grounders around the infield, too. I saw people of all ages–grandfathers down to two year-olds–and they were all having a wonderful time! What a fantastic community event! Finally, at one of my routine check-ins over on the third base line I got the OK that they were ready for numbers 120 through 130. YES!!! Michelle walked with me up to the shade behind the batting cage. I had about fifteen minutes to get ready so I picked out a bat and helmet. 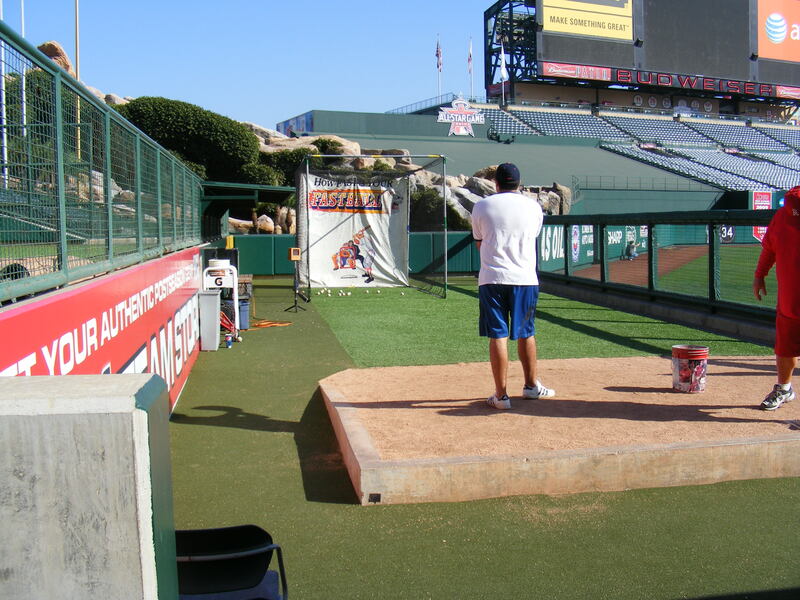 Then I practiced my swing, tried to get the timing of the pitching machine (it looked to be going at about 60-70mph), and took a bunch of pictures. I was pretty much just hoping to not embarrass myself. “Gosh, what if I get up there and swing and miss ten times?” I got pretty nervous. 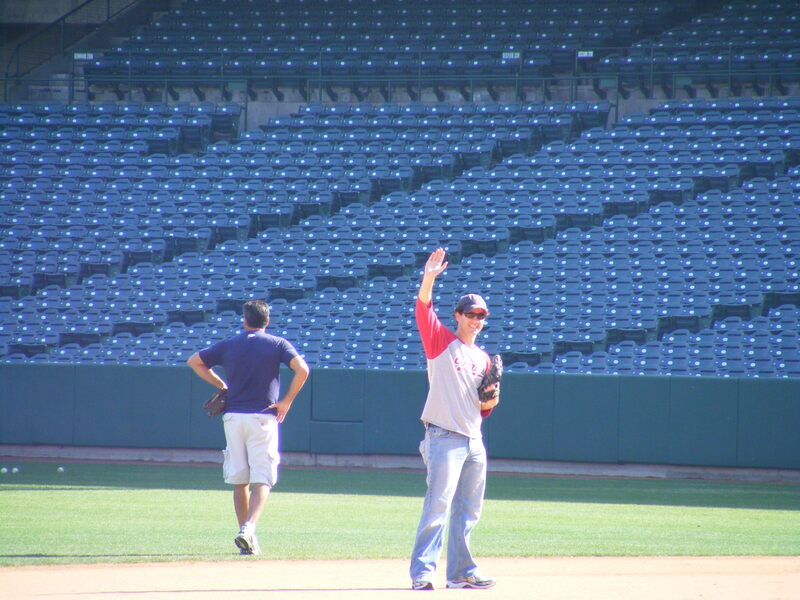 over to the first base side so she could get some pictures of me hitting. As I was on deck I watched the guy ahead of me rocket a couple deep to the outfield After he hit we had to “shag ’em up” so I helped with that. Then it was my chance to hit. 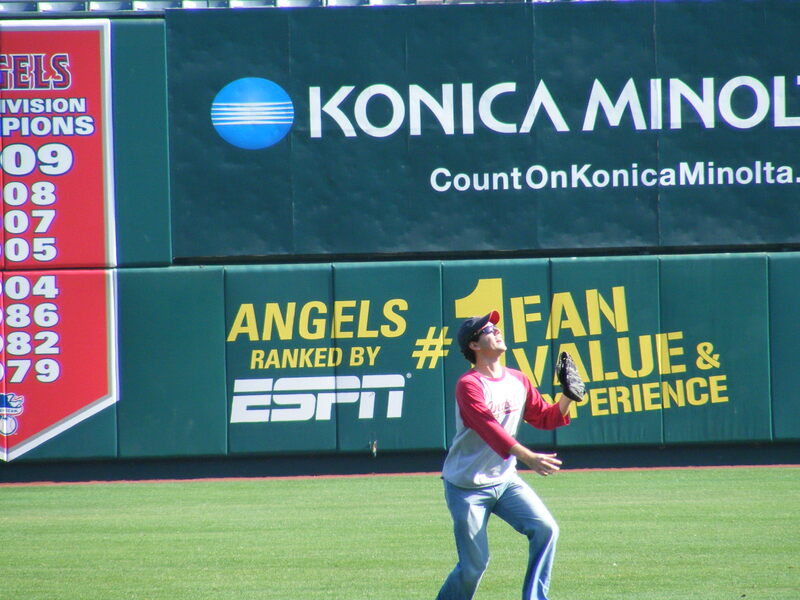 Before I go on let me just say that I have no idea how a baseball player catches up to a 95mph fastball. Also, it’s hard to hit off a pitching machine, but I won’t make any excuses. I certainly would love to tell you that I hit a home run. But that would be a lie. As a matter of fact, I didn’t even hit a double. I think two of the balls I hit would have been singles. I certainly made good contact but I couldn’t elevate anything. I hit a couple line drives, a couple grounders, and a couple bloops that were gobbled up by infielders. I pulled everything, of course. And, as it turns out I did miss about half of the pitches entirely. Bah. 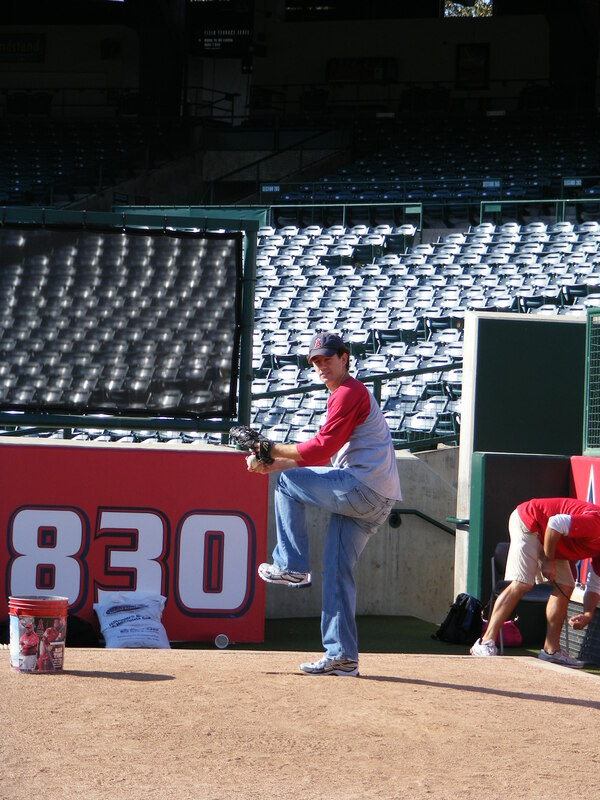 But it was still one of the most fun things I’ve ever done at the ballpark. And after I hit (and Michelle had been allowed to take photos from right behind the pitching screen) I checked out my stance and my facial expression in the pictures. Ridiculous! Michelle and I took a walk after that, starting at first base and heading all the way around the warning track through the outfield. 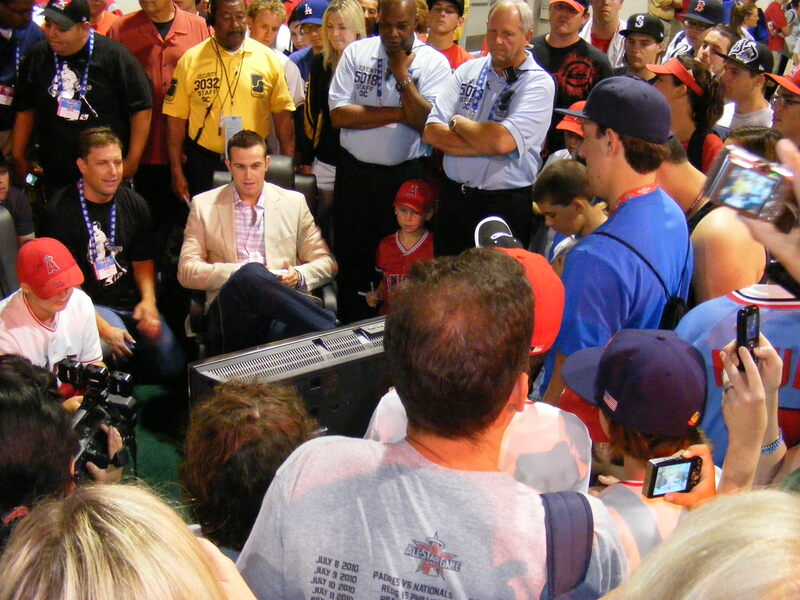 The first thing I spotted was a fly ball machine that had been used earlier in the day for people that wanted to pay twenty-five bucks to have someone shoot fly balls at them for fifteen minutes. Can you spot the AFL ball? Next we headed into right field. I’d never seen that eighteen-foot wall from this side before. That’s a big ol’ wall. 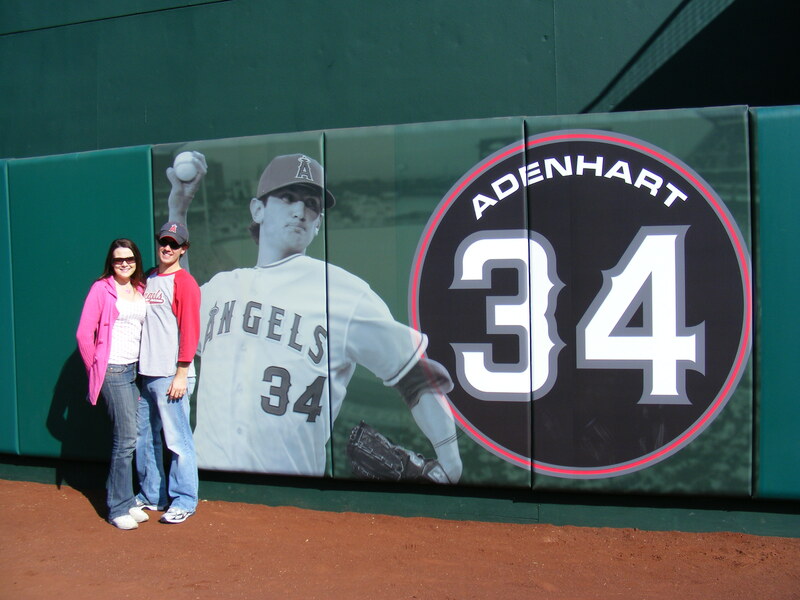 We made our way to the Division Title banner and the Nick Adenhart mural and a family out there taking pictures was kind enough to snap one of us, too. 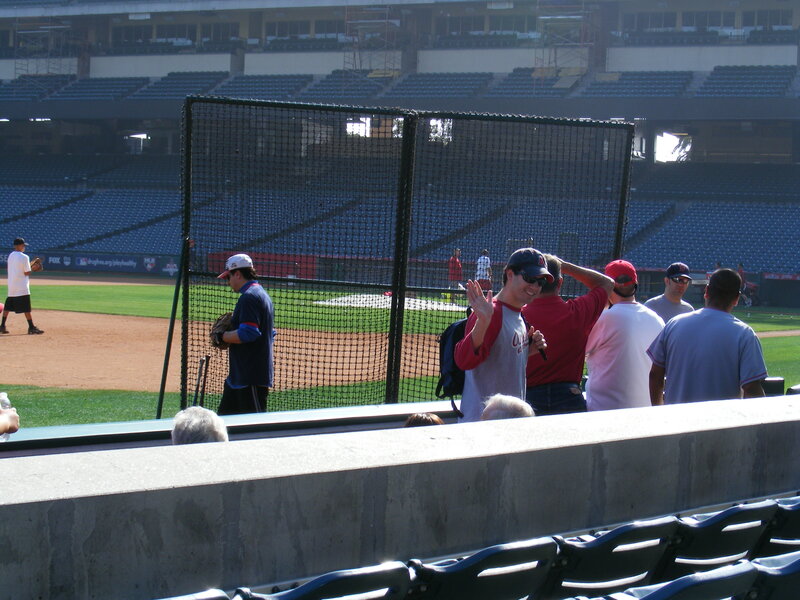 As we continued I snuck a peak behind the open center field gate. 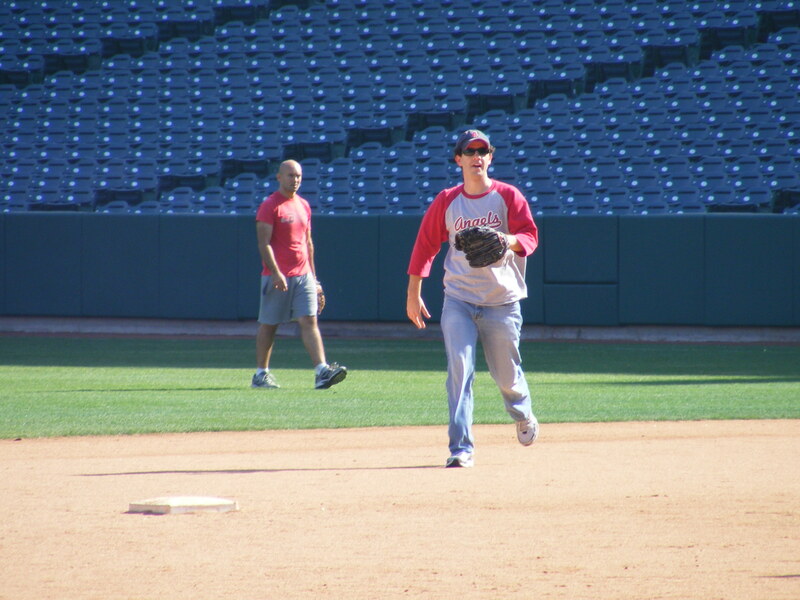 This was after I experimented with whether or not I’d be able to rob someone of a home run. My analysis: Yes. I could. As we headed to left field we walked into the tunnel where the bullpens are located. 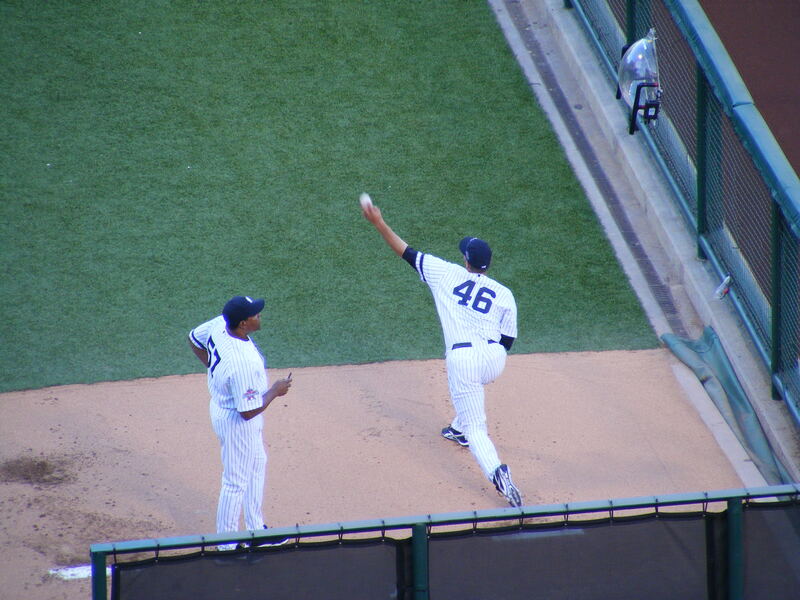 I went up the steps and saw the guy in front of me finish throwing. 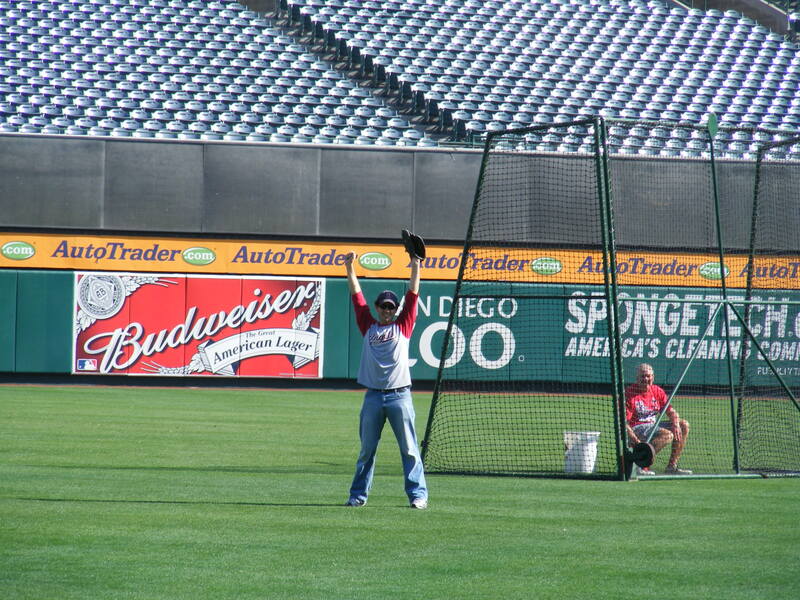 I had a coupon to give the groundskeeper that allowed me three pitches. 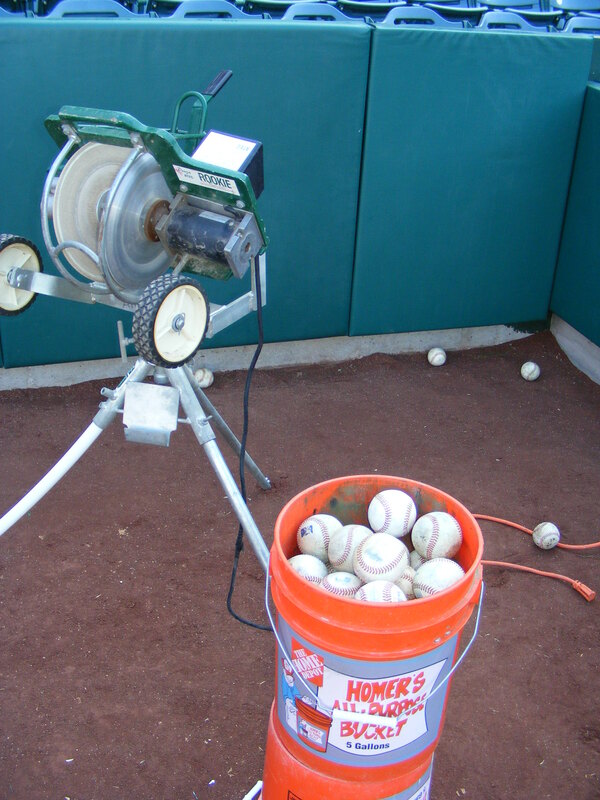 He said I could just throw a few to get warmed up, then he got a call on his cell phone and left the bucket of baseballs near my feet. Michelle snapped photos as I threw a few (the second one sailed over the net entirely (oops!). 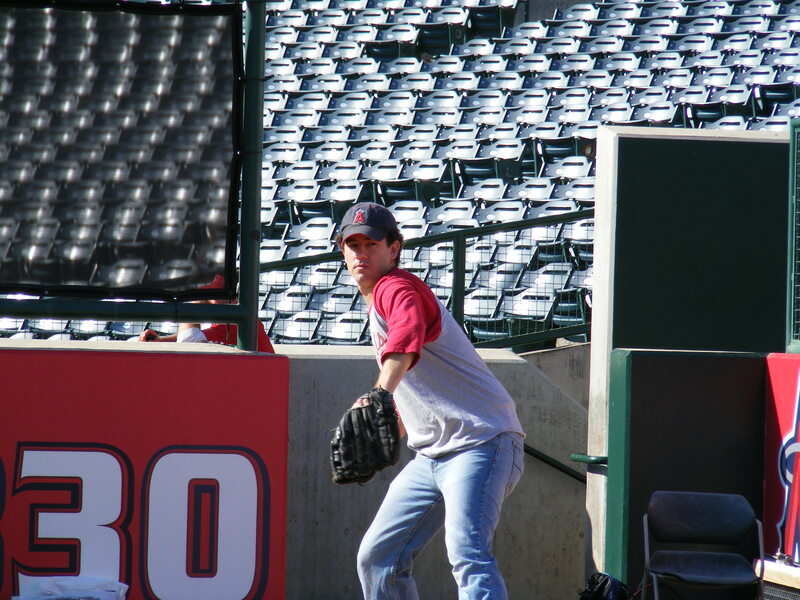 But then I settled down and threw a series of 60mph fastballs for strikes. Then I tried to ramp it up a bit and as I increased my velocity my accuracy went out the window. Oh, well. I guess I’d be primarily known for my defensive prowess were I a professional ballplayer. At least, that’s what I tell myself. 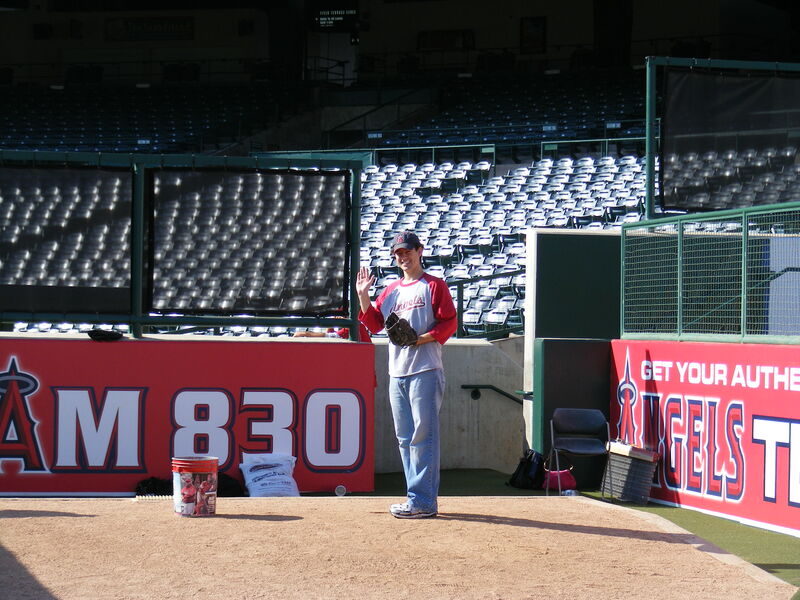 I threw the whole bucket of baseballs (there wasn’t anyone else waiting) and then thanked the grounds crew guys before leaving the bullpen. Our adventure on the playing field was pretty much done at this point. I took a couple more pictures from where I’d been standing in left field earlier in the day and then Michelle and I walked past the dugout and up into the seats. Honestly, I would’ve stayed there until they closed for the day at 4:00pm but we had a few errands to run and I had a show to stage manage that evening. Man, it was a ton of fun and as we left I told Michelle, “We’re definitely coming back next year.” I checked my watch and it was 12:30pm. We’d spent more than two hours there and it had only cost us ten bucks (and that was donated to a great charity). As we were leaving Michelle mentioned she’d taken a video that she knew I’d enjoy watching. I put it on YouTube. What a cool event–and an awesomely good time! people in line at that point. knew that they’d all be batting from the right side of the plate. all you want and it really doesn’t do you any good. 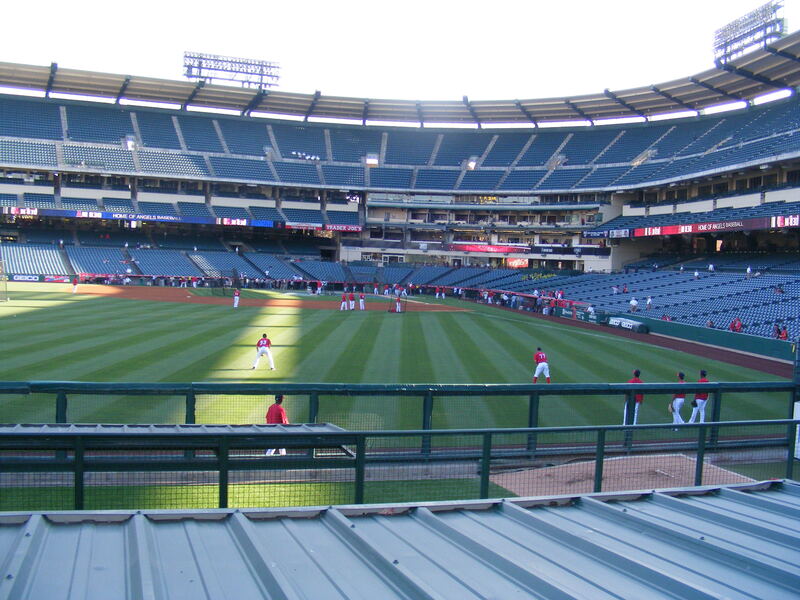 5:00pm–gates opened and off I went, sprinting left instead of right. the ground for Easter eggs… nothing. Dang. 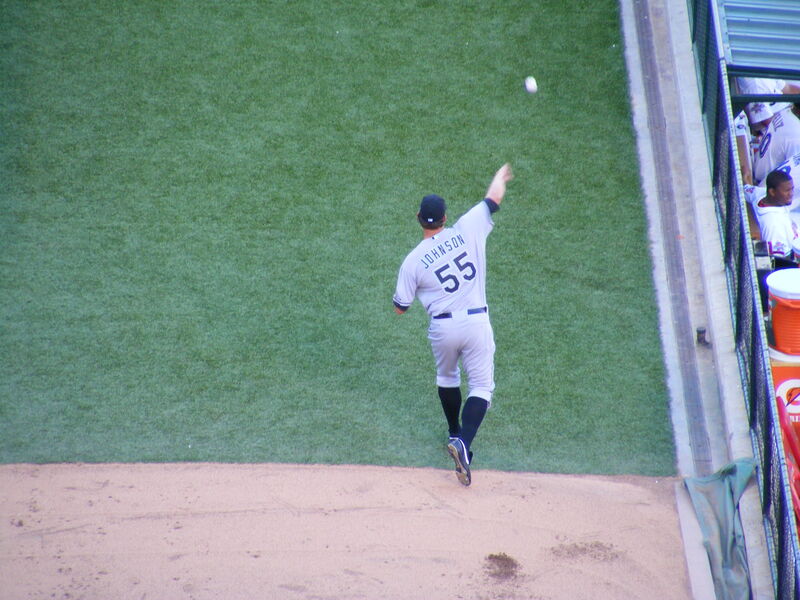 ball back to Robb and then I called out to him and held up my glove. He fired a strike right to me (over both pens) and I thanked him. PRACTICE stamp on the sweet spot. More on this ball later. 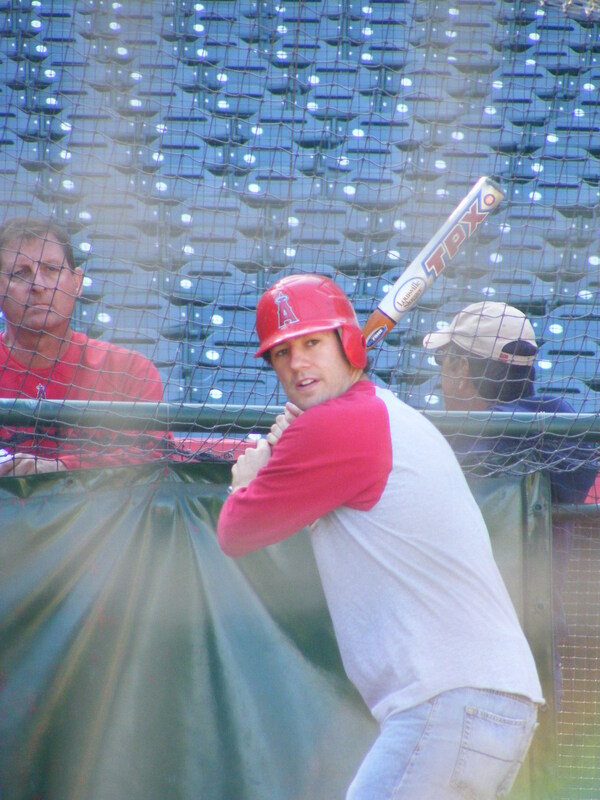 field foul pole as the Halos finished their second round. 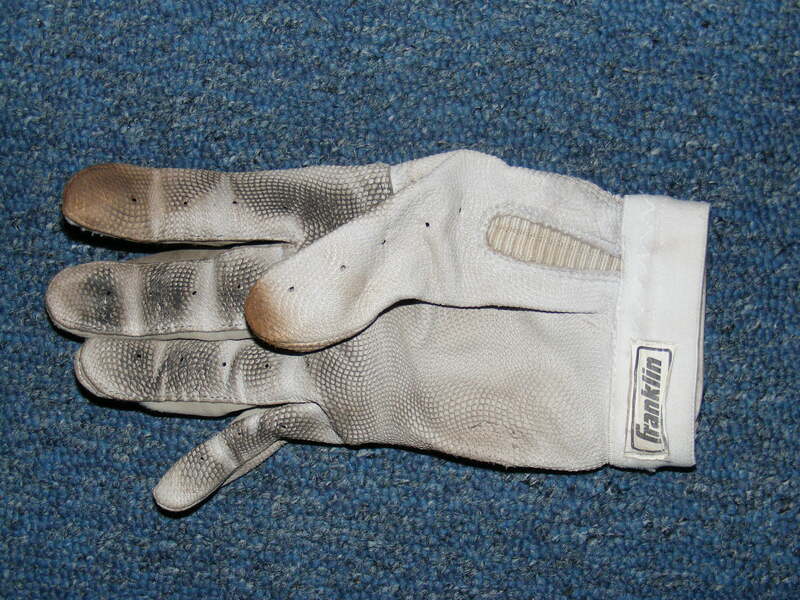 fully extended my glove, and–OUCH! guy… nor are many of the other regulars, as it turns out. them, didn’t even look, and tossed them up as he went down the steps. minute. It was really impressive! anyone younger or cuter he tossed it to me. Sweet! 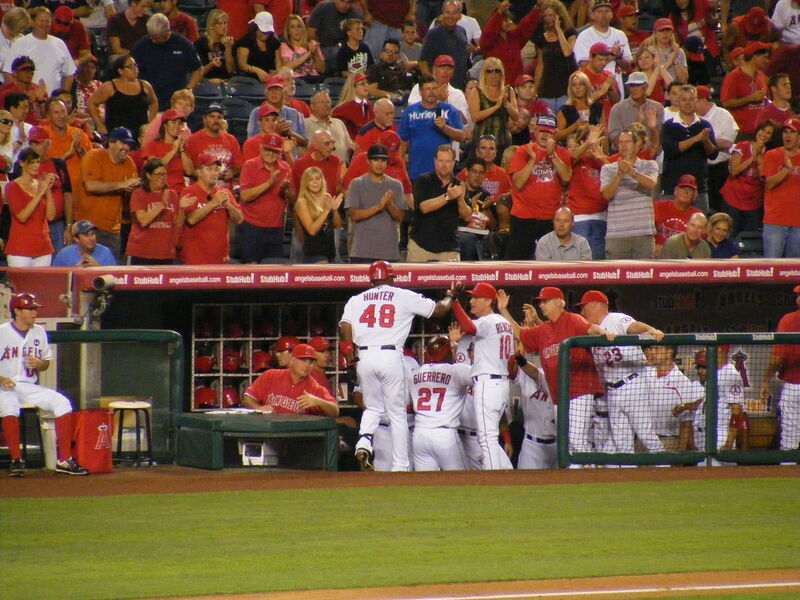 And in the second the Angels went up 2-0 on a Torii Hunter home run. got him a third run in the seventh. 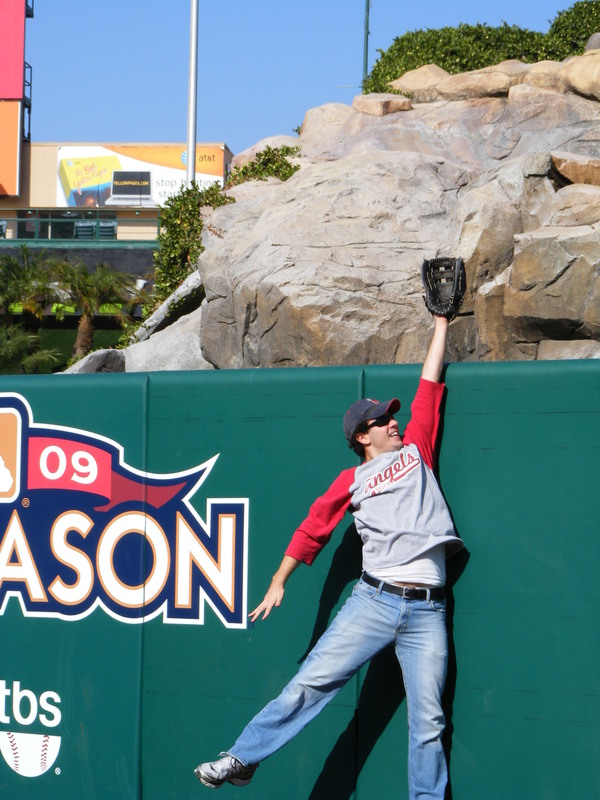 Just hoping for a foul ball… nothing came close though. 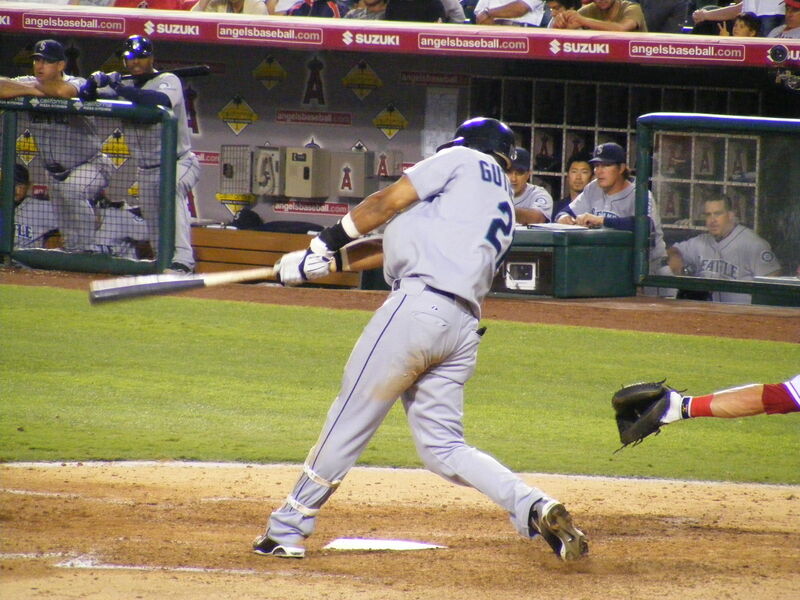 Gutierrez made the second out. temporarily and give it away when I was at the game on Saturday. 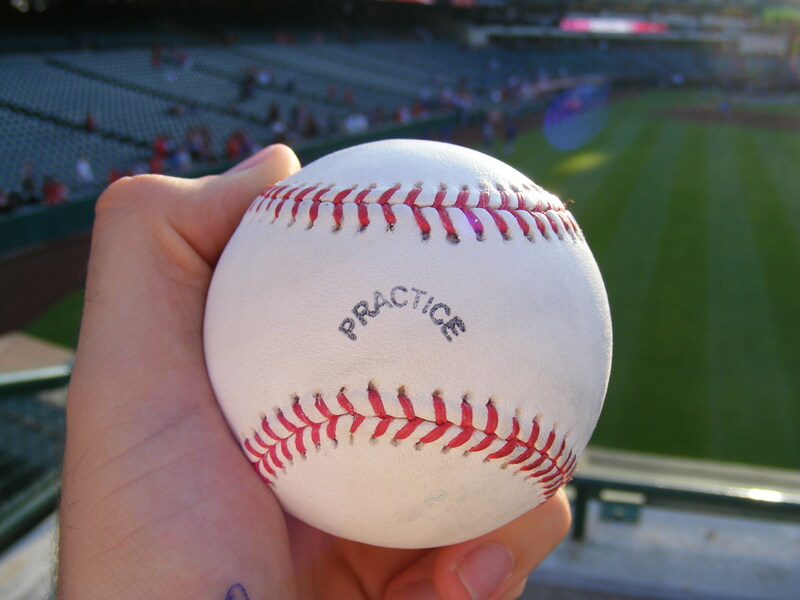 practice… but you never can tell for sure.